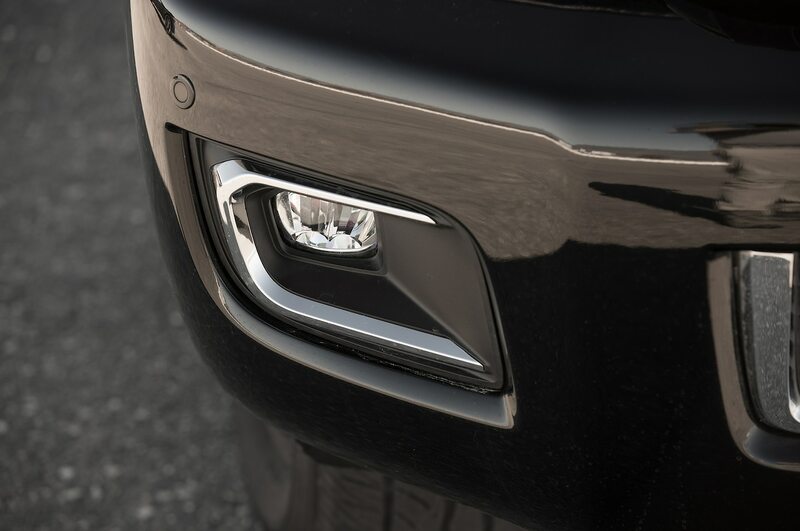 As Americans, we ask a lot out of our family vehicles. 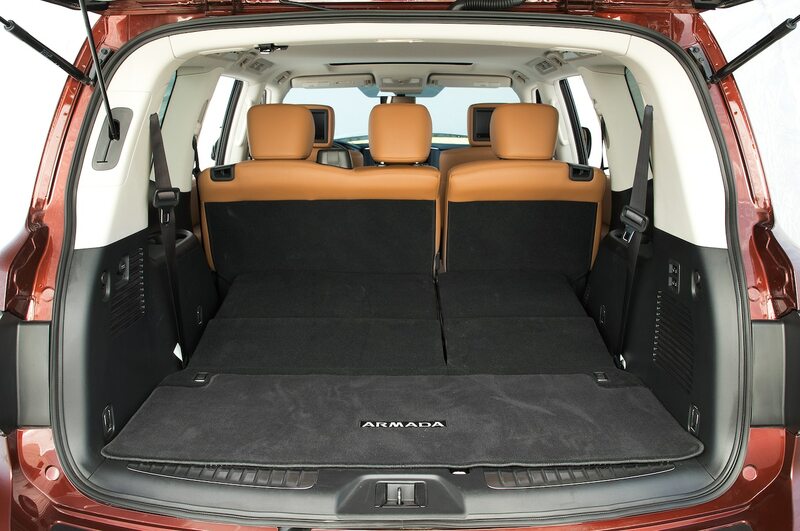 But none exerts itself harder than the full-size, three-row SUV. 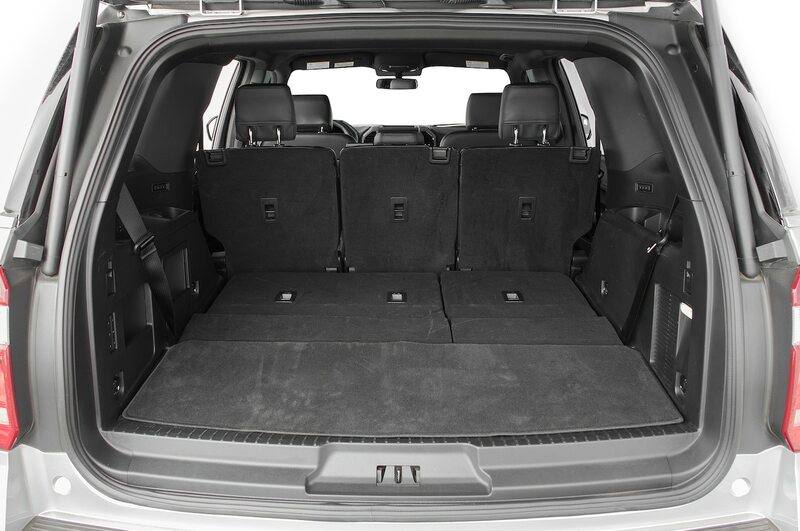 These seven- and eight-seat SUVs are tasked with shuttling family members to school, jobs, and sports practice during the week. 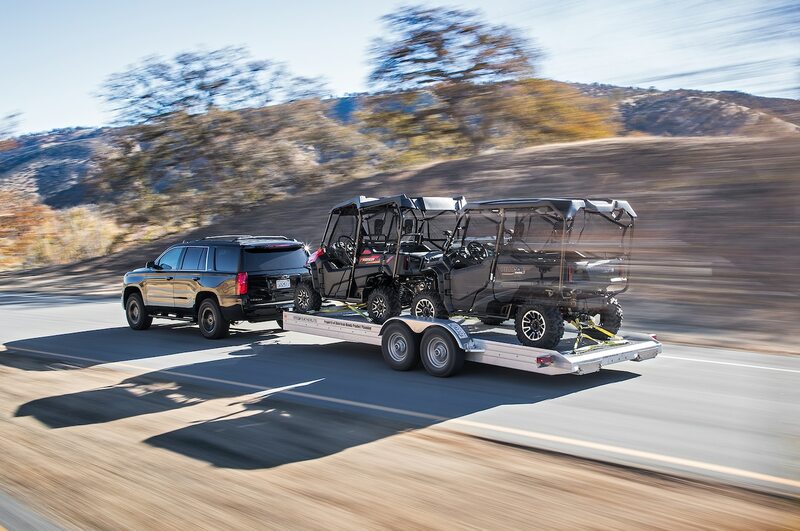 On the weekend, these workhorses support our hobbies—from towing horses or boats on trailers to taking us down remote two-tracks to our favorite hiking or hunting spots. While we play, they work even harder. 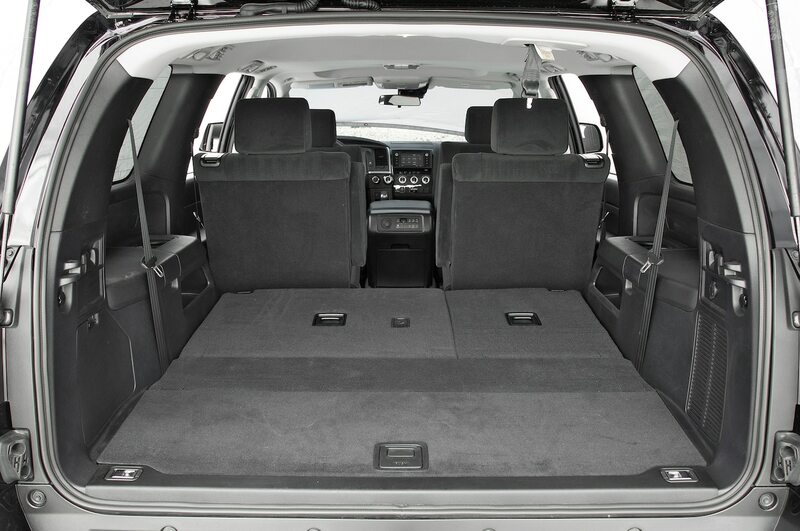 Because of the honeydew lists we place upon these big family SUVs, manufacturers build ’em tough. 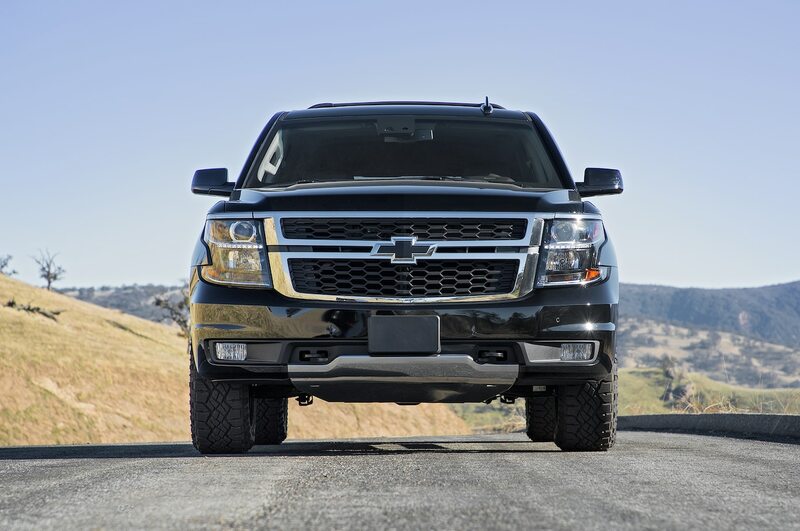 They typically feature big V-8 engines, four-wheel drive, and full-size pickup-based platforms. 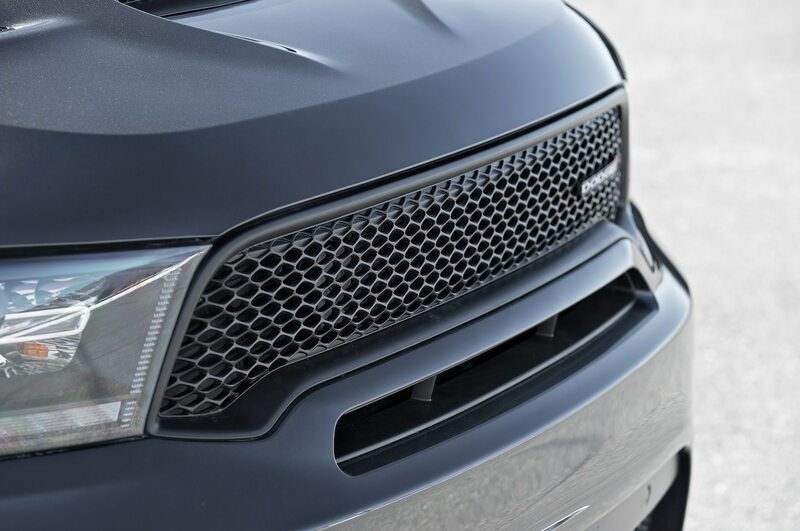 Given how many jobs we expect these SUVs to do, our testing will ask more of ’em, too. 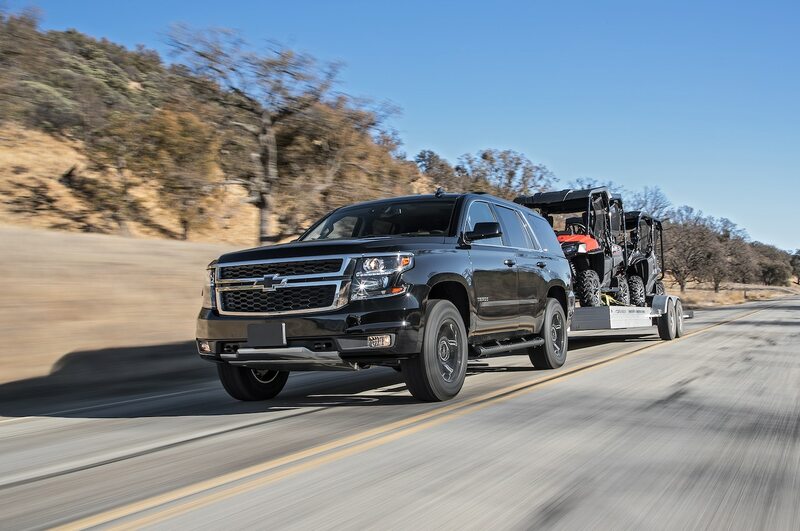 On top of the usual criteria—you know, driving, riding, and handling, plus the ability to comfortably swallow at least seven passengers and their cargo, all without breaking the bank—we’re also going to ask our trucks to tow a trailer loaded with Honda Pioneer side-by-sides aalthough nd complete a rough-and-tumble off-road obstacle course. 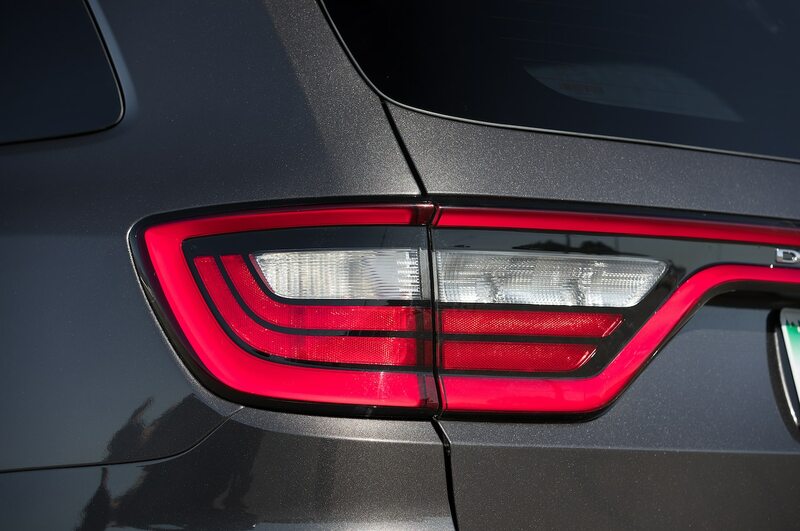 Our invite criteria was pretty simple: three rows of seats inside, a minimum towing capacity of 7,000 pounds (3,175 kg), four-wheel drive, and a $65,000 USD price cap, which, shockingly, is about the average transaction price for this segment. 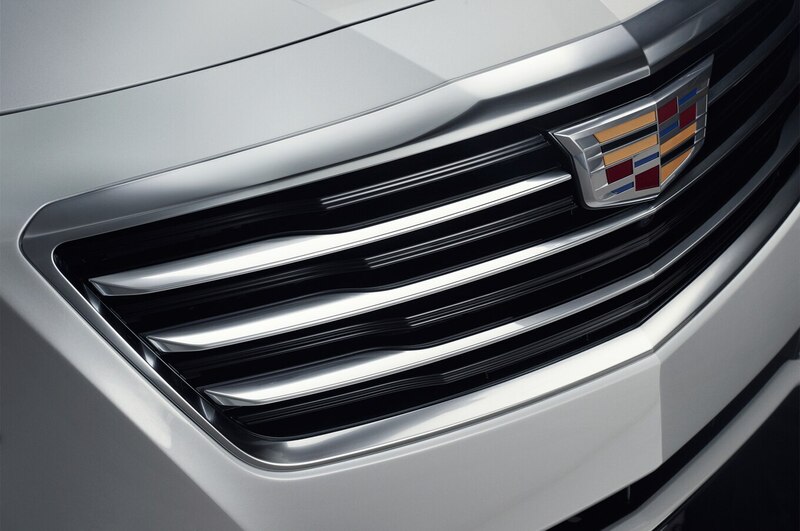 The SUV most synonymous with this segment is the Chevrolet Tahoe and its extended-length twin, the Suburban. 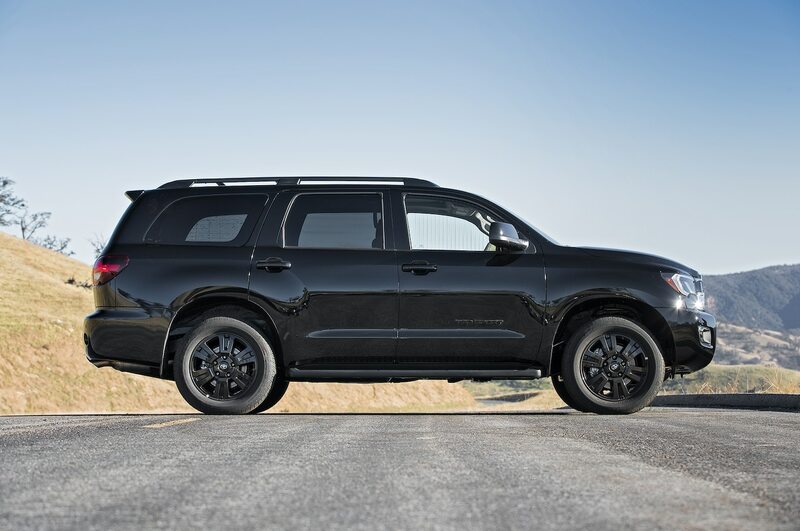 The undisputed segment best-seller, the Tahoe (and the virtually identical GMC Yukon) has been continually improved since the current generation made its debut three years ago. 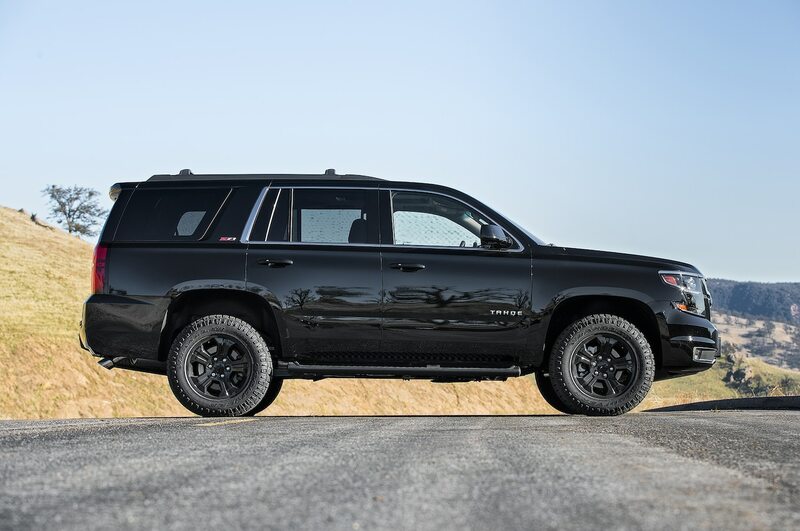 Our 2018 Chevrolet Tahoe 4WD LT started its life as a midlevel model but is loaded with options, including the Z71 Midnight Edition package, which adds off-road tires, an off-road-oriented suspension, a revised front bumper, black paint, and some decals. 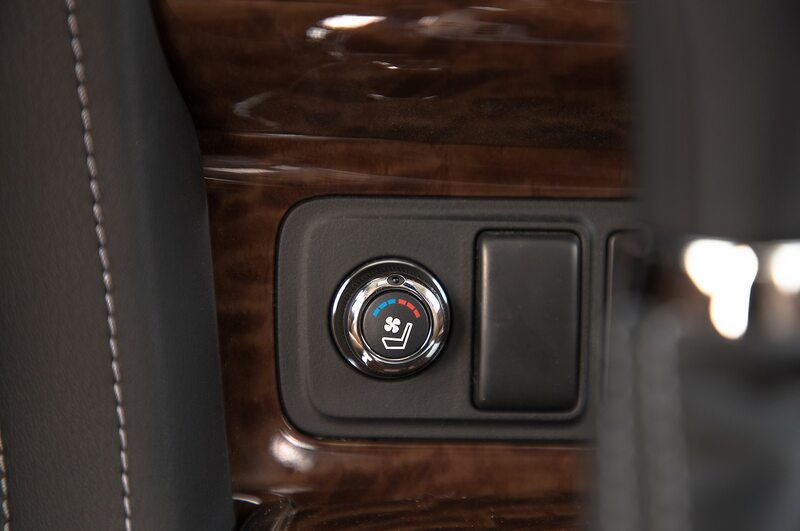 Our four-wheel-drive Tahoe is powered by the standard 5.3-liter V-8 paired with a six-speed automatic. 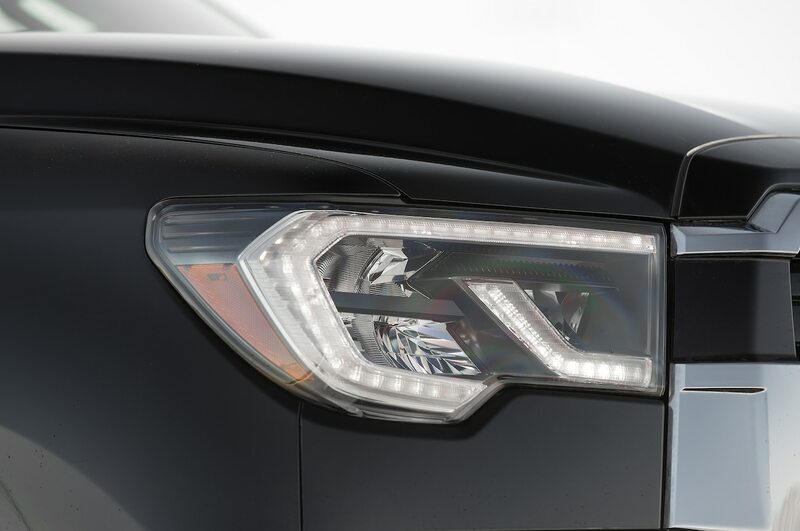 It’s tough living in the shadows, but Ford has done its best to ensure the new-for-2018 Expedition gets its chance at the spotlight. 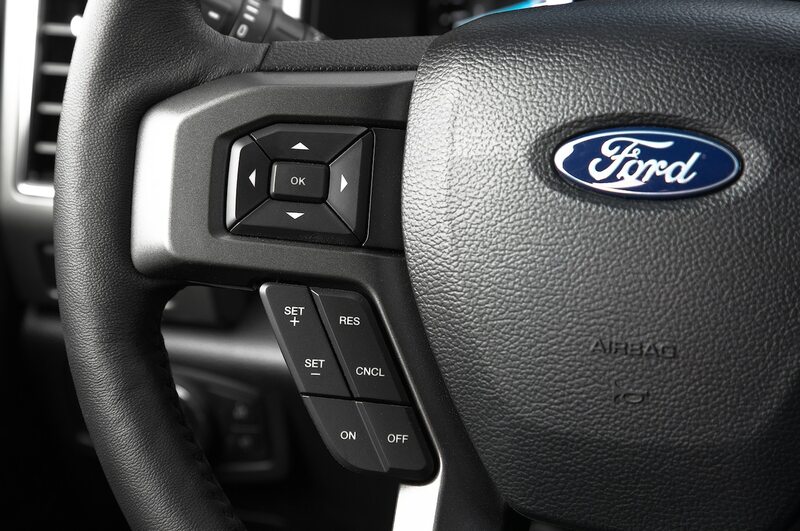 Our 2018 Ford Expedition XLT 4×4, like all new Expeditions, is built with lessons learned developing the best-selling, Truck of the Year–winning Ford F-150. 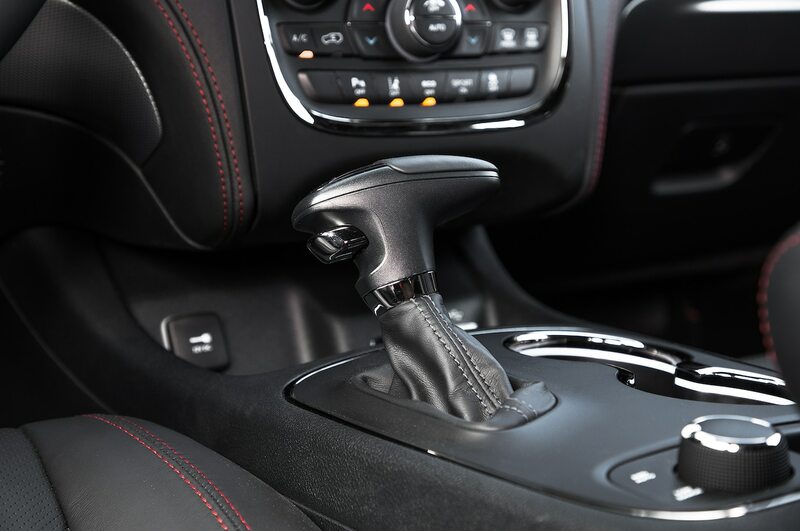 Its sleek new sheetmetal is made of aluminum, and under the hood it sports a 3.5-liter twin-turbo V-6 paired with a 10-speed automatic transmission and optional all- or four-wheel drive—our tester is equipped with the latter. 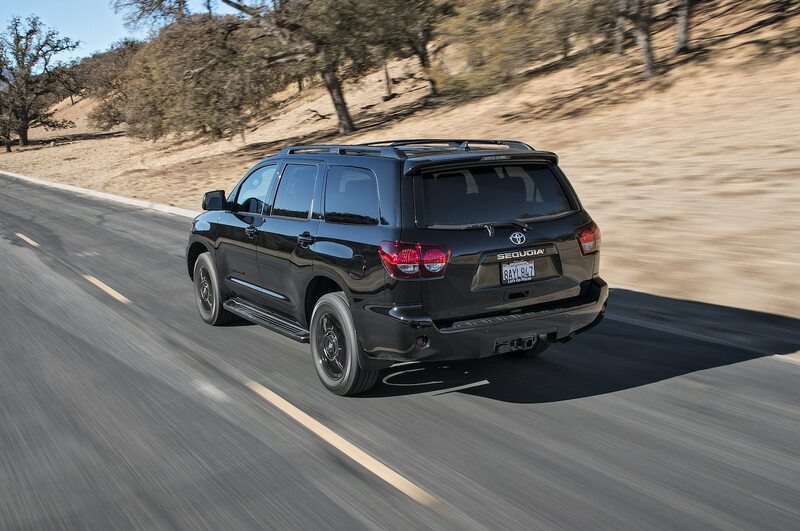 Big full-size SUVs aren’t just an American thing; Toyota has been playing in the segment since 2000 with the Sequoia. 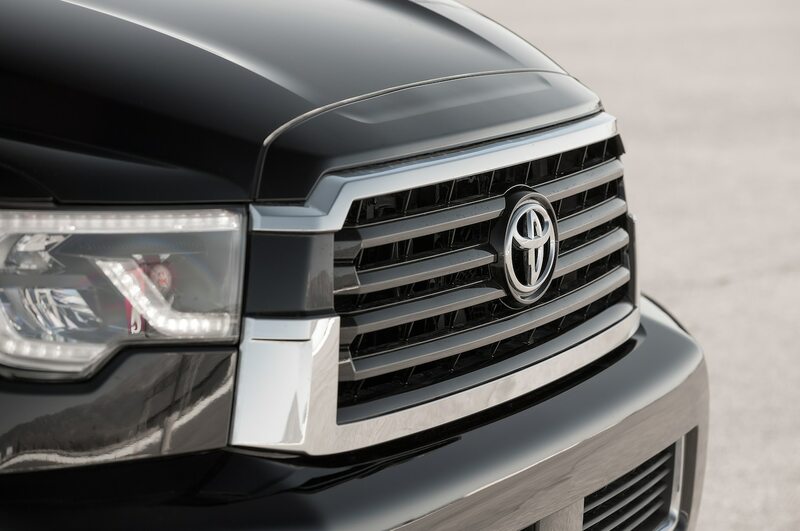 Although largely unchanged since it made its debut in 2008, Toyota gave it a handful of updates for the new year. 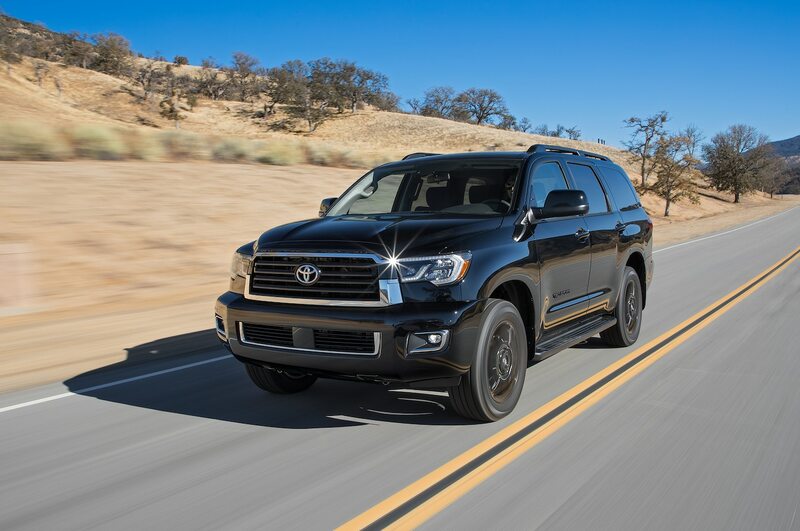 Our 2018 Toyota Sequoia TRD Sport 4×4 is the newest trim level, and it, like the rest of the lineup, gets LED headlights and some infotainment updates this year. 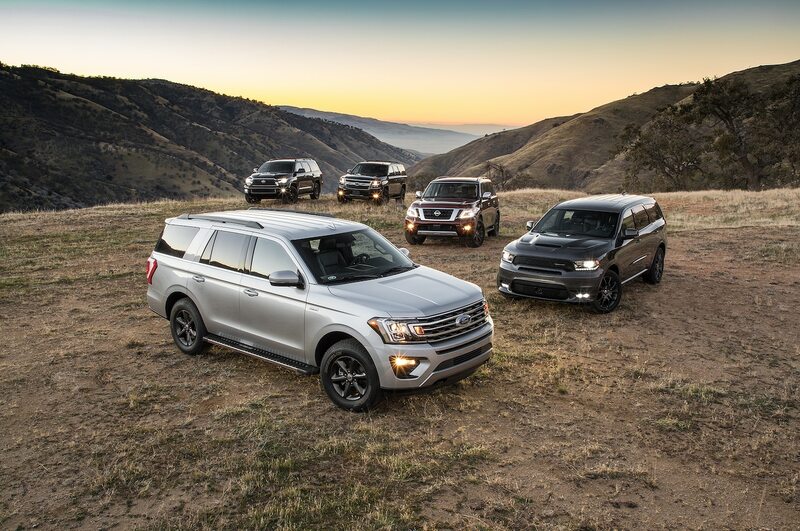 Despite the Sequoia’s new nose, under the hood it soldiers on with a 5.7-liter V-8 paired with a six-speed auto and optional four-wheel drive. 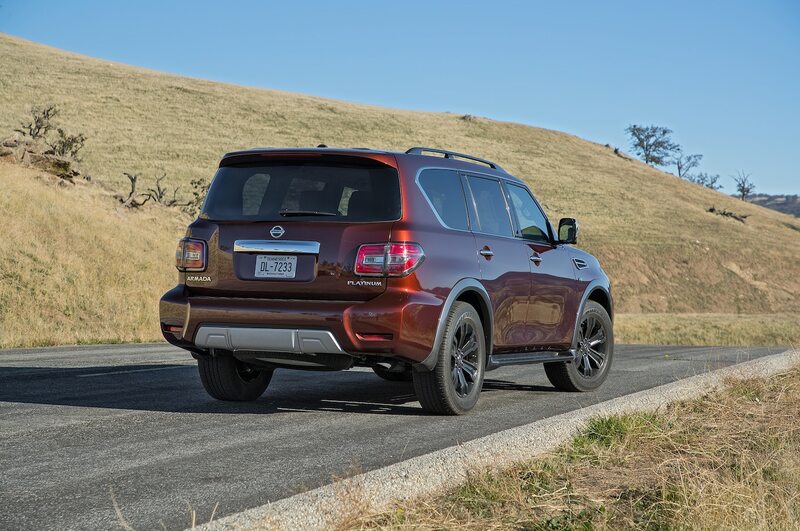 Nissan has also been a player in the segment with the Armada. 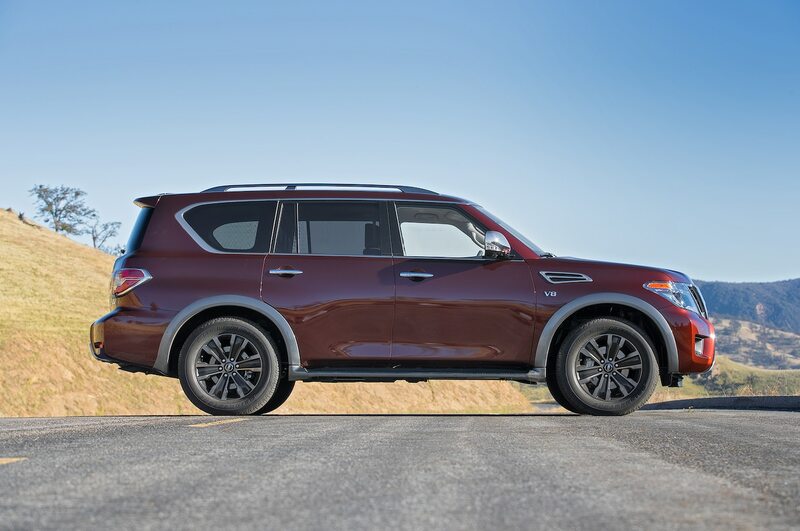 The second-gen Armada just arrived Stateside in 2016, but it has been hiding in plain sight on American streets since 2010 as the Infiniti QX56 (now called the QX80) and globally as the utilitarian Nissan Patrol off-roader. 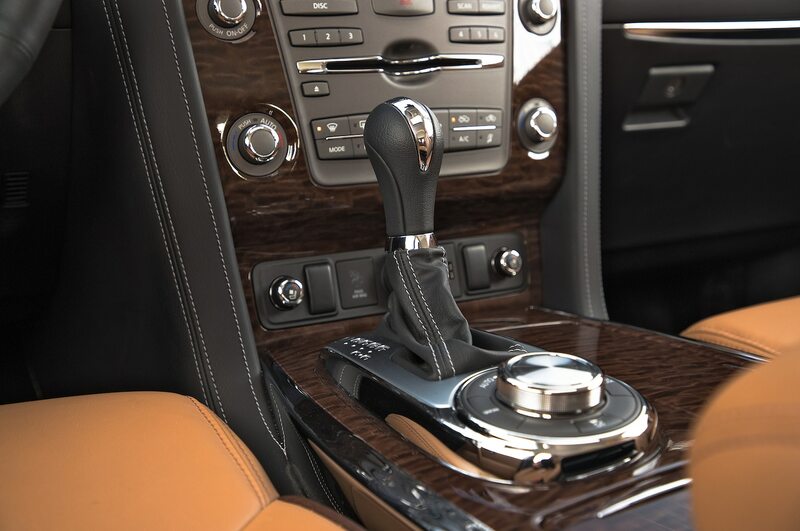 The U.S.-spec Armada is a hodgepodge of the two, sporting the latter’s sheetmetal and the former’s interior and engine, a beastly 5.6-liter V-8 mated to a seven-speed automatic. 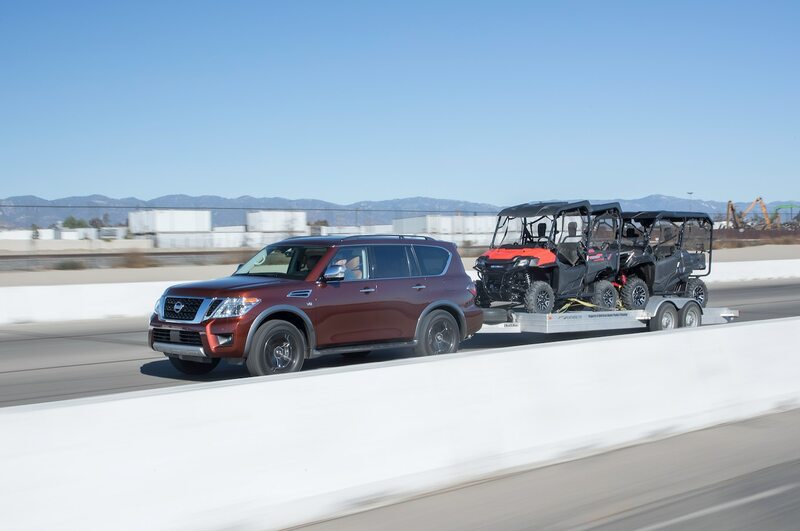 Our tester is a loaded 2018 Nissan Armada Platinum model equipped with optional four-wheel drive. And that brings us to our final contender. 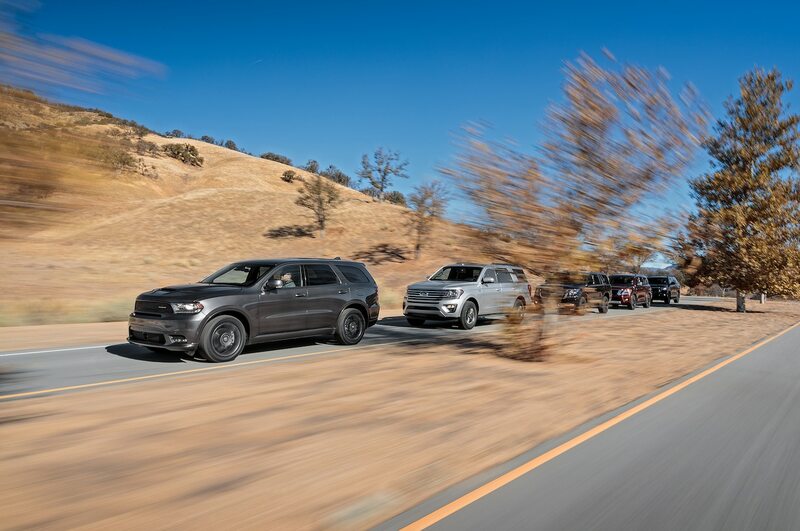 A Big Test needs to be just that, so to round out our field, we invited an SUV that artfully straddles the line between full-size crossover and full-size SUV. 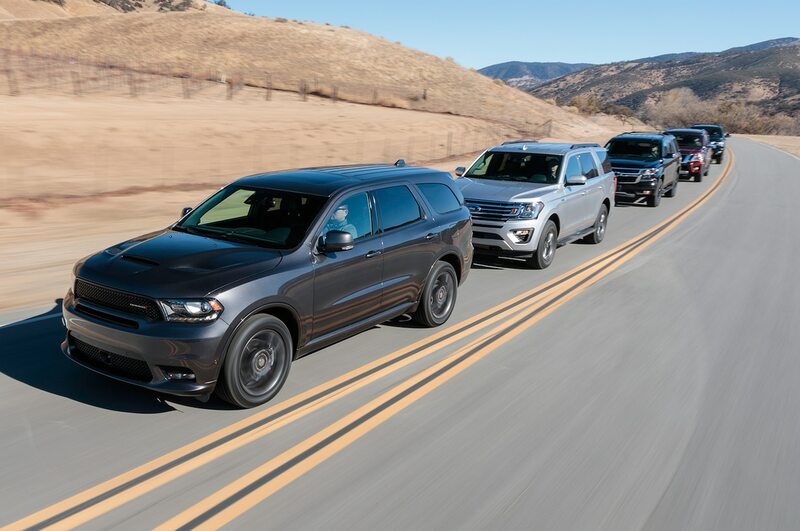 Our 2018 Dodge Durango 4 R/T is just slightly bigger than many midsize crossovers and slightly smaller than these full-size SUVs. 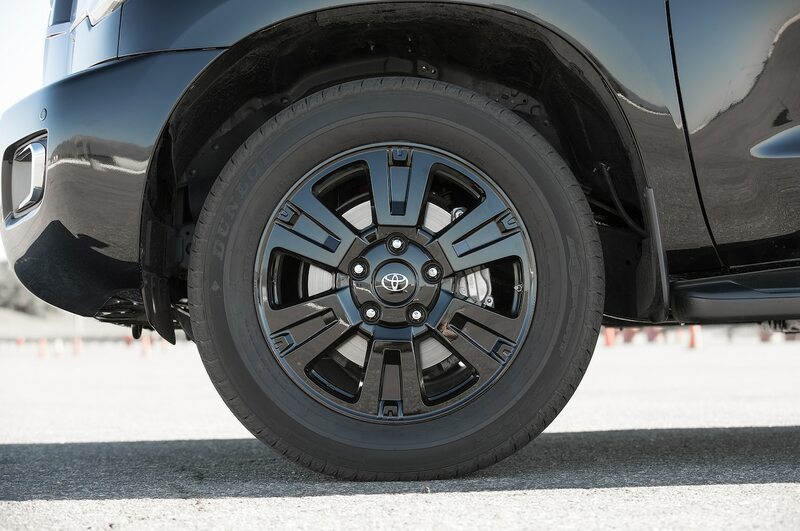 (Its wheelbase is actually significantly longer than the Tahoe’s, but it’s about 2 inches shorter in overall length). 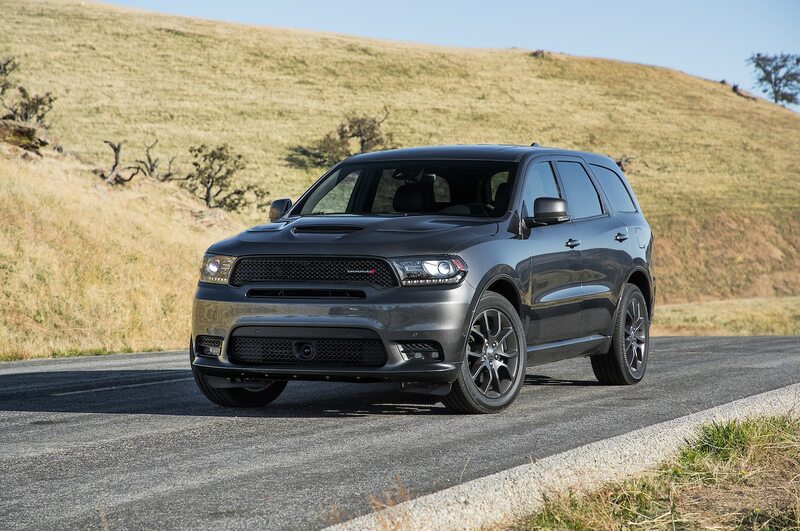 The only SUV not built in the old-school body-on-frame fashion, our Durango tester features the optional 5.7-liter V-8 sending power through an eight-speed automatic and a four-wheel-drive system borrowed from the Jeep Grand Cherokee. With two weeks of extensive testing to tackle, we kicked things off with our real-world evaluation loop, which includes city streets, highway speed stretches, twisty roads, and sections of asphalt so bad that the county is continually attempting to repave it. 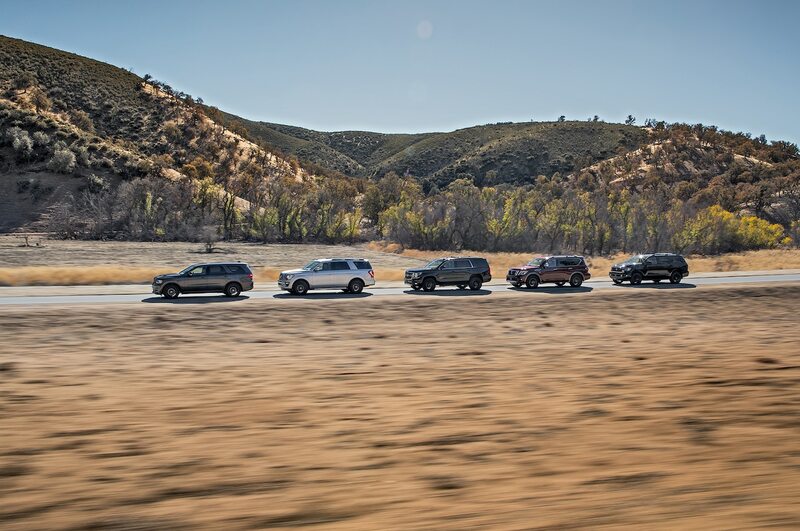 Basically, it’s just about everything these SUVs would have to tackle in a given month in a tidy 21-mile (34-km) stretch of coastal SoCal. The differences between the five SUVs were readily apparent from the get-go. 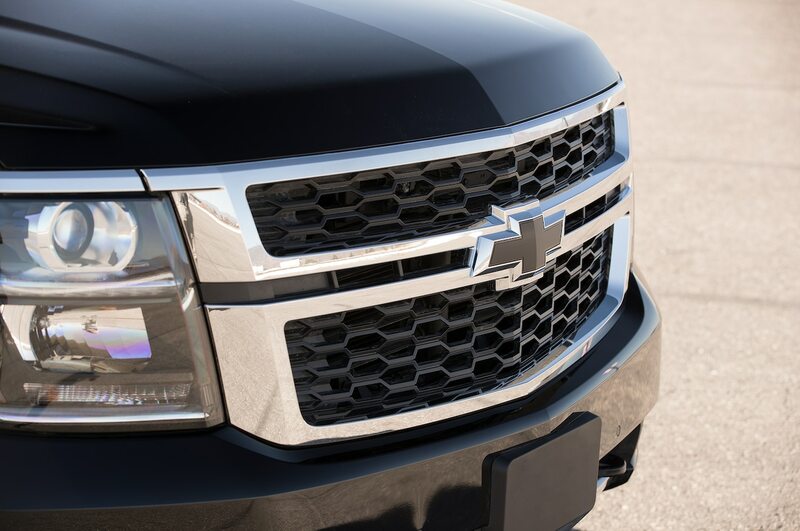 The Chevrolet Tahoe feels every bit as truckish as the Silverado platform it rides on. 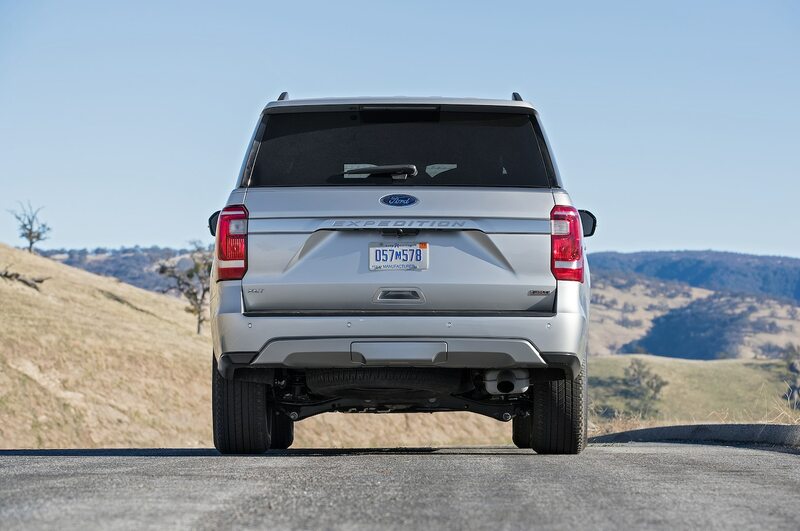 Although the Tahoe isn’t the only SUV here riding on a pickup platform (the Sequoia and Expedition ride on ladder frames based on those of the Tundra and the F-150), it’s the only one to use a pickup’s live rear axle, meaning both rear wheels share an axle, and thus any impact felt by one tire also affects the other. At least it swaps the pickup’s leaf springs for better riding coils. 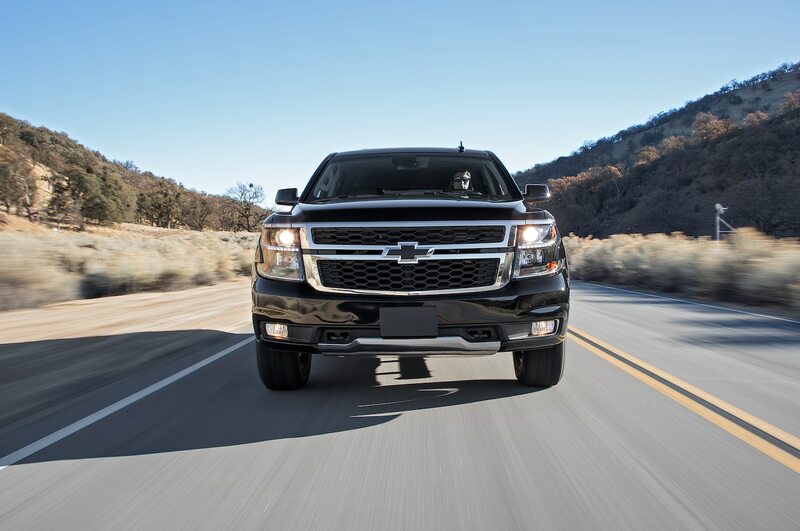 Typically used in pickup trucks because their inherent strength outweighs the ride-quality penalty the design suffers, its appearance in the Tahoe is likely a cost-savings measure that negatively affects its ride and handling. 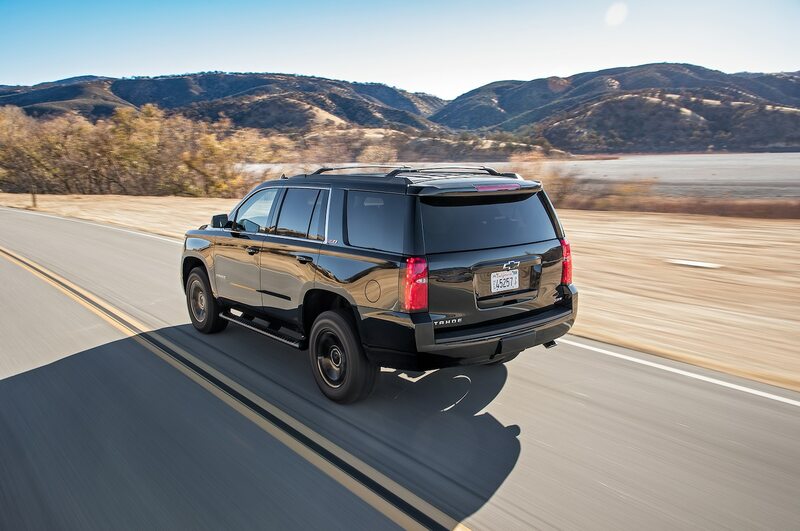 The Tahoe’s rear-axle design makes the SUV feel stiff—though compliant—and busy while going down the road. 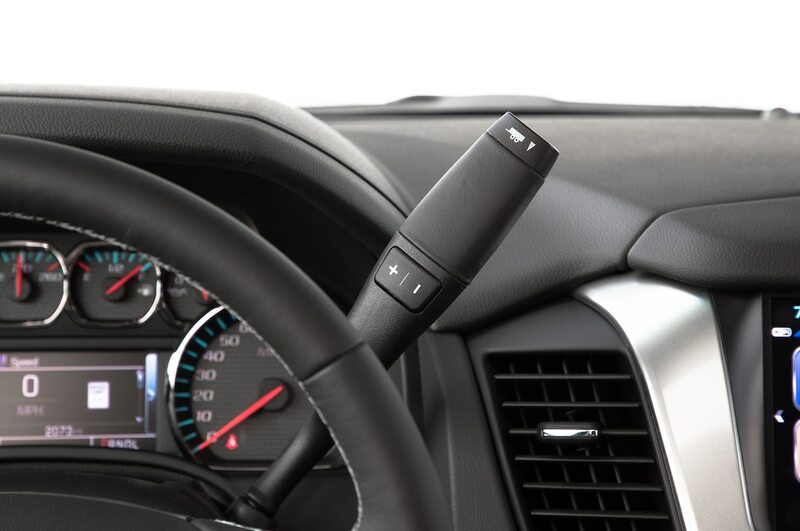 The optional off-road tires don’t do the Chevy’s steering any favors through corners, either; they trade numb steering feel in favor of aggressive tread for off-road use. 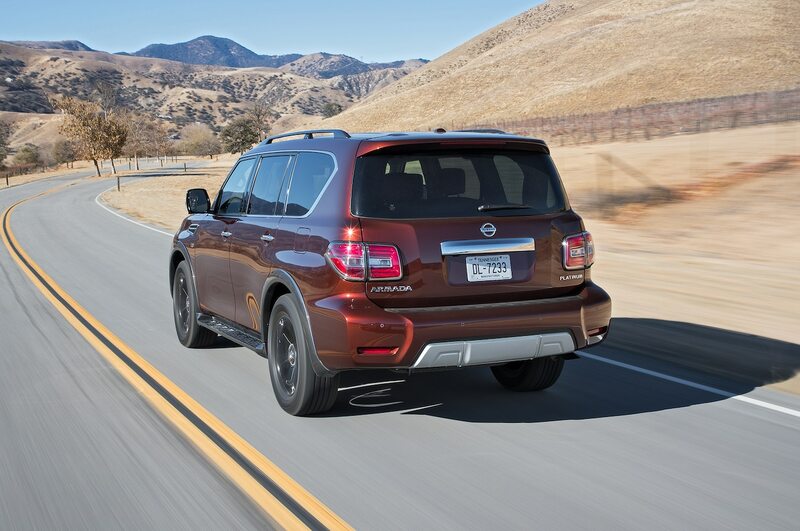 If the Tahoe is on the harsh end of the ride spectrum, then the Nissan Armada is on the soft end. The Armada’s ride is mostly supple and floats over most impacts, only hobby horsing on harsher, repetitive bumps. 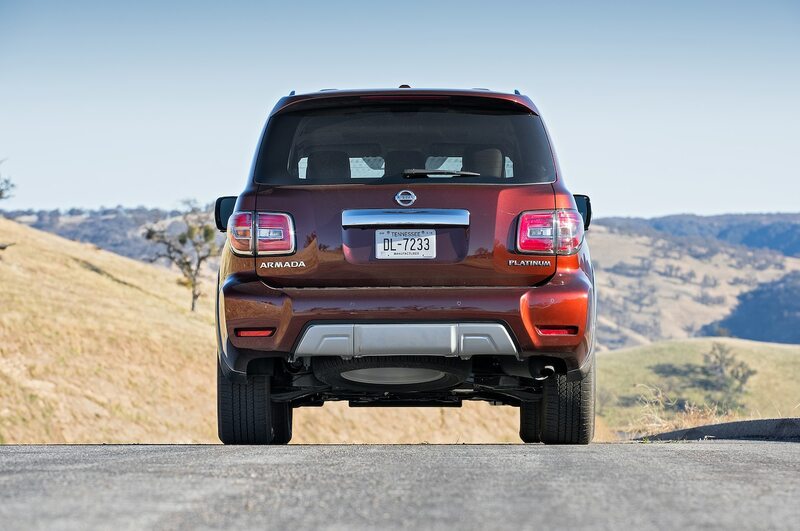 The soft suspension does, however, mean that the Armada leans a ton through corners, sending unsecured cargo flying as the Nissan rounds bends. 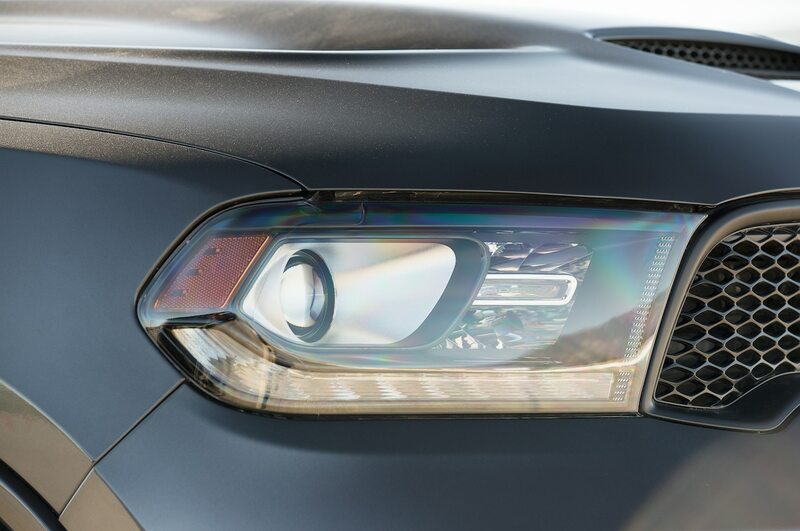 The Ford falls somewhere between the Dodge and Chevy on the stiff end and Nissan on the soft end of the ride and handling spectrum. 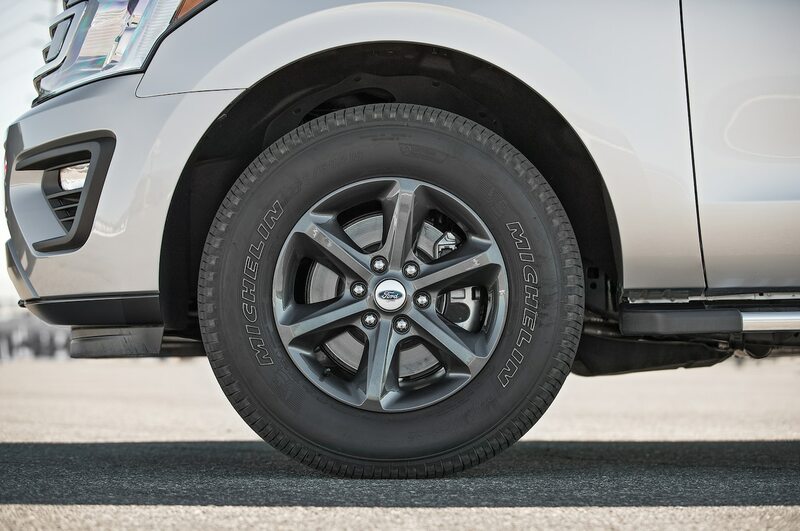 Equipped with an optional off-road-oriented package featuring an off-road tire, it suffers from far fewer ride and handling trade-offs than the Tahoe. 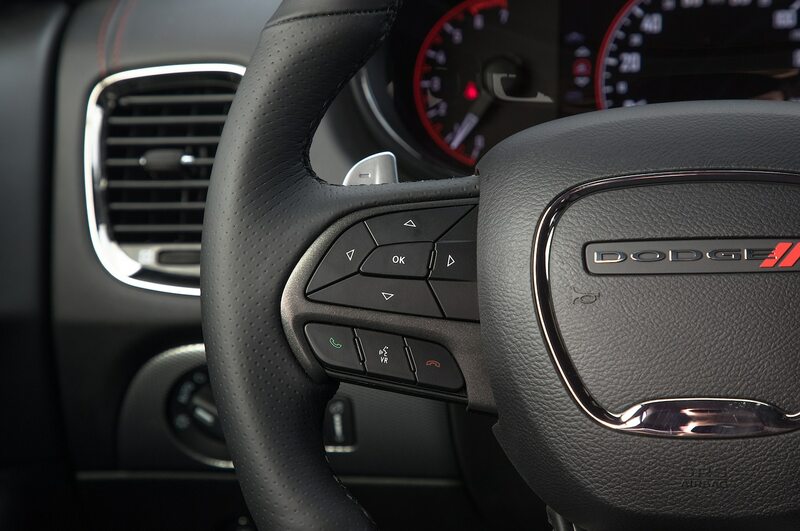 “It has impressive body control,” associate editor Scott Evans said. 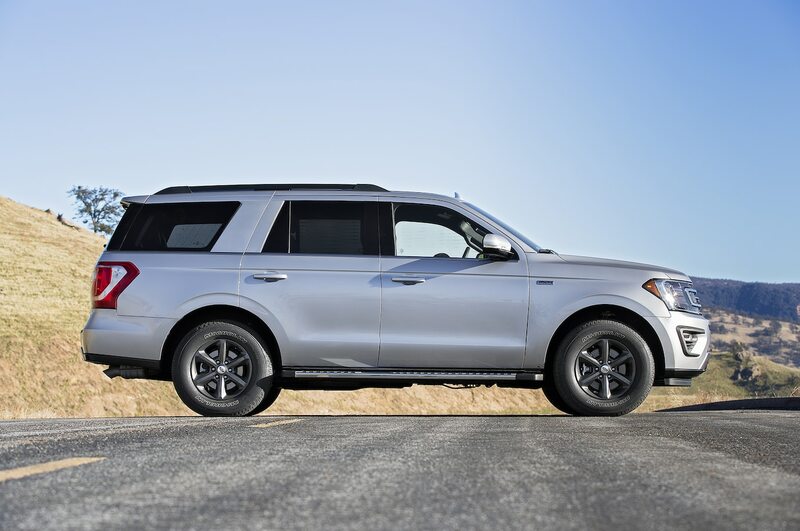 “There’s surprisingly little body roll for such a large vehicle, and it rolls over onto the outside wheels smoothly every time.” The Expedition handles pretty well, too, with accurate but not talkative feedback from the wheel. 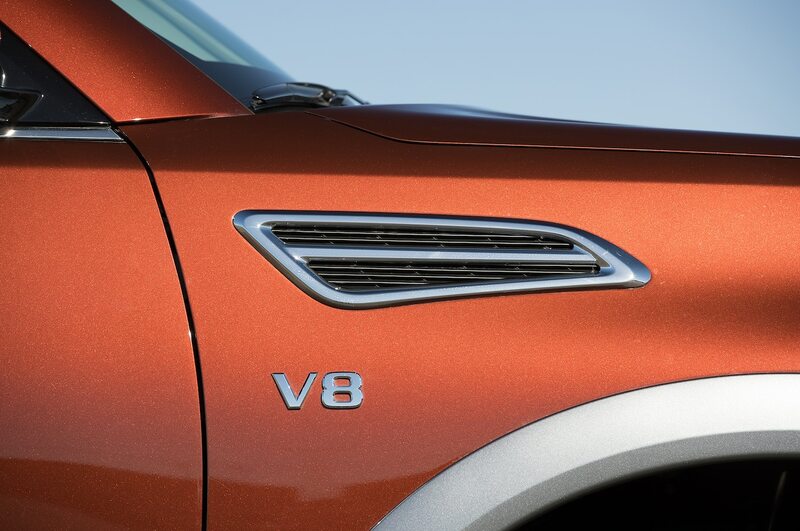 The performance formula for SUVs in this class used to be pretty simple: big, lazy V-8 paired with a four- or five-speed transmission. My how things have changed. 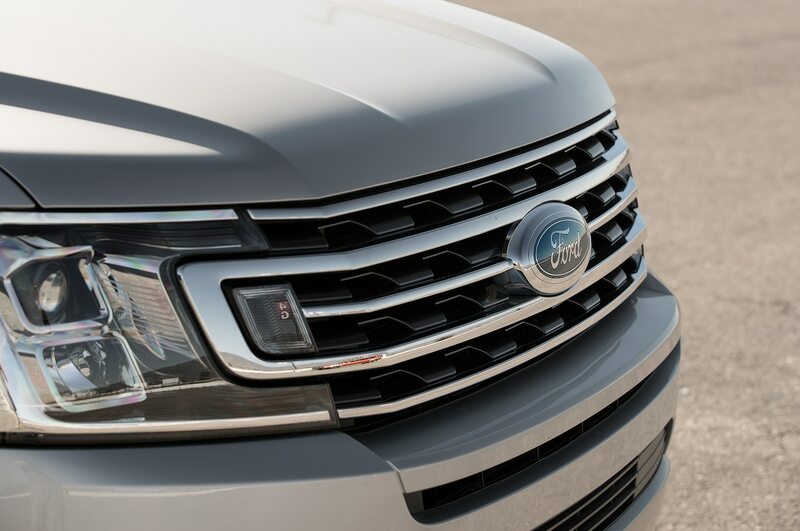 The biggest departure from yesteryear can be found under the hood of the new Ford Expedition. 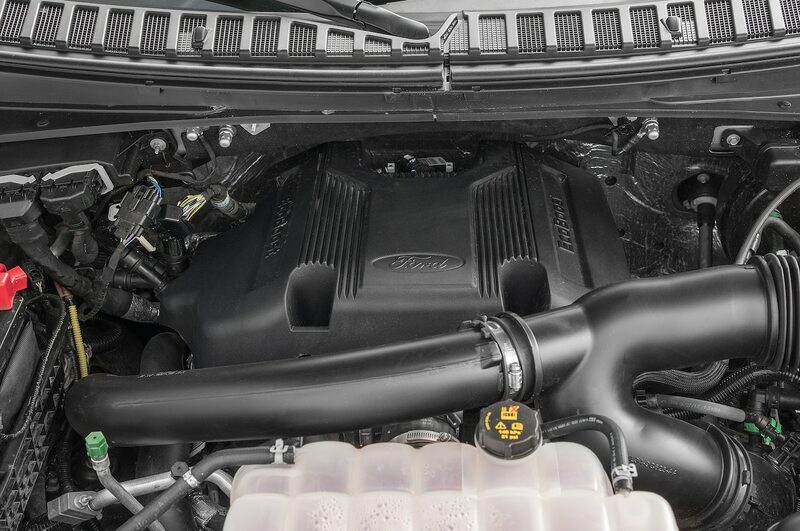 Ford ditched its 5.4-liter V-8 late in the previous-generation Expedition’s life in favor of its EcoBoost twin-turbo V-6, and the Blue Oval doubled down on its commitment by pairing the newest version of the EcoBoost V-6, now churning out 375 hp and 470 lb-ft of torque, with a 10-speed automatic transmission. 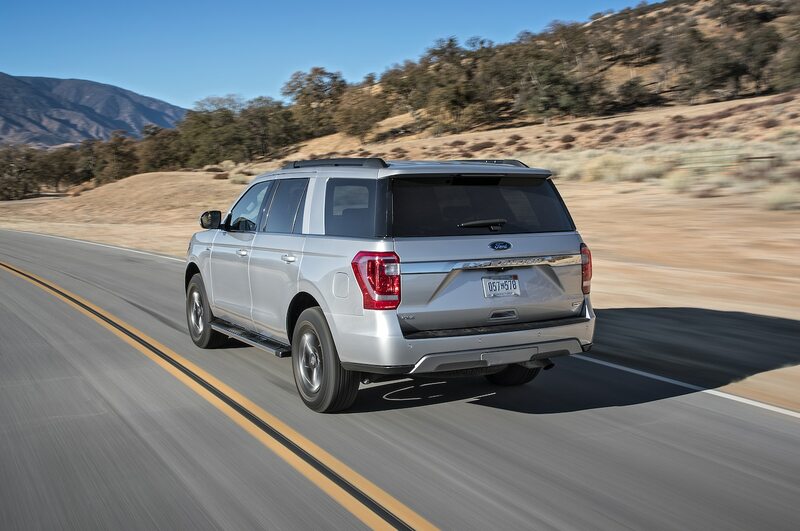 The benefits of the new powertrain coupled with the weight savings of its aluminum body panels mean the Expedition was among the quickest in our test, accelerating from 0 to 60 mph in just 6.2 seconds and needing 14.8 seconds to get through the quarter mile at 91.7 mph (147.6 km/h). 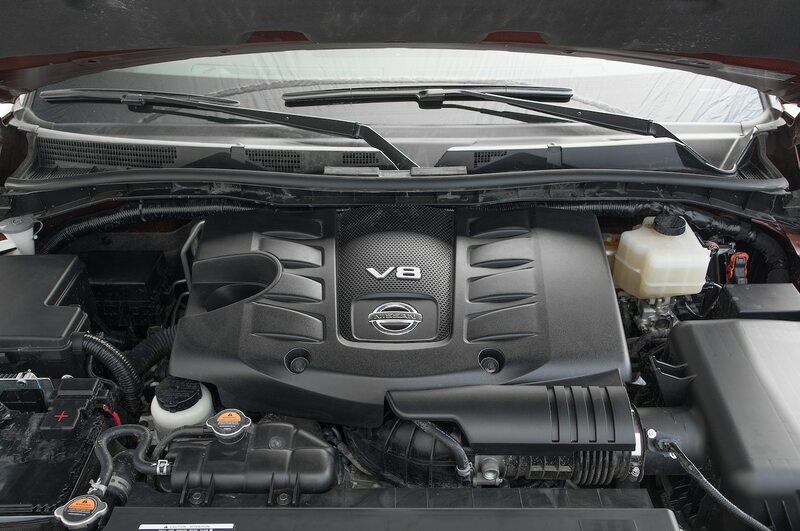 You’ll never miss a V-8 with this engine; it’s responsive and has a big, meaty torque curve. 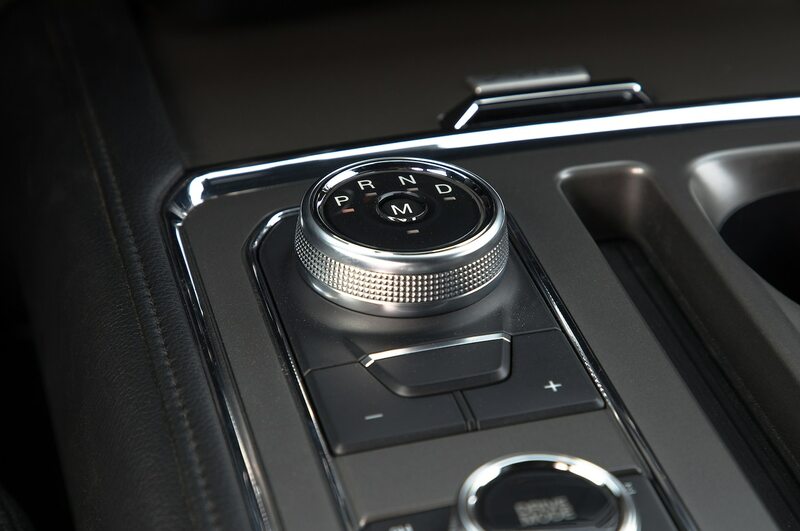 The gearbox is great, too, shifting almost imperceptibly in the background and always choosing the right gear. 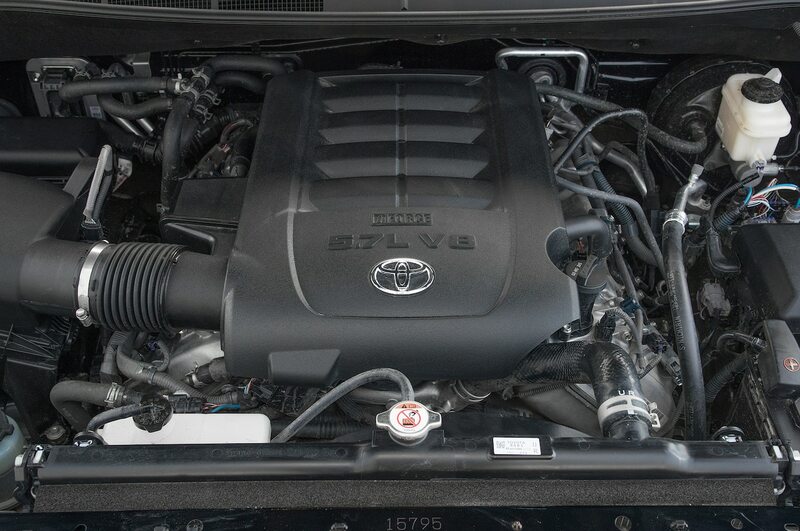 For a vehicle that’s essentially 10 years old, the Toyota Sequoia’s powertrain is pretty nice. 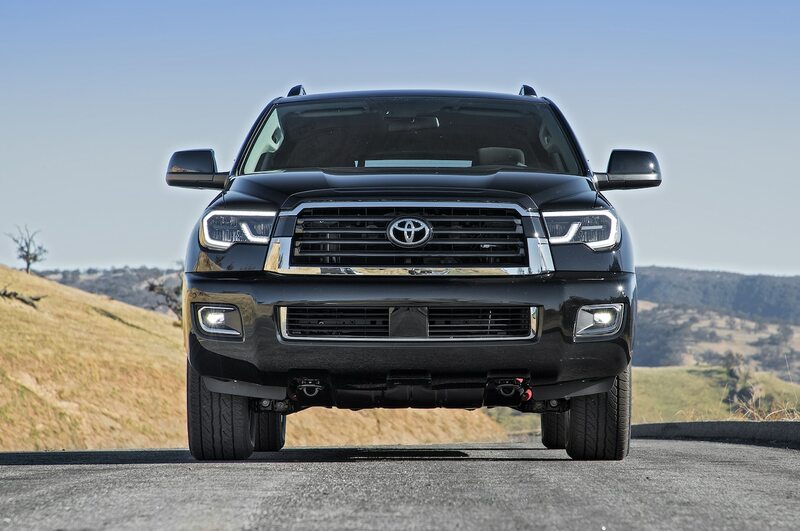 Its 381-hp, 401-lb-ft 5.7-liter V-8 gets the Toyota moving smoothly, if a bit slowly, but kick down a bit into the throttle to get the six-speed auto to downshift, and it’ll scoot. 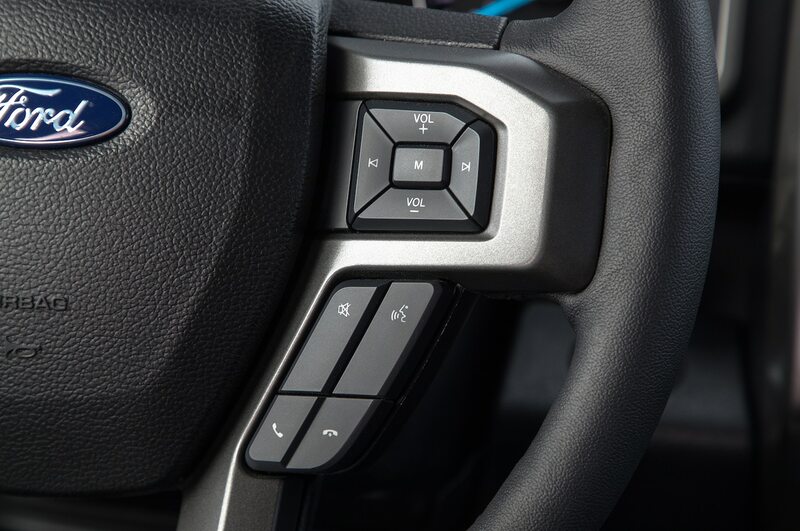 “It sounds good and pulls strong, but when accelerating you can feel the powertrain vibrating the steering wheel,” Ayapana said. 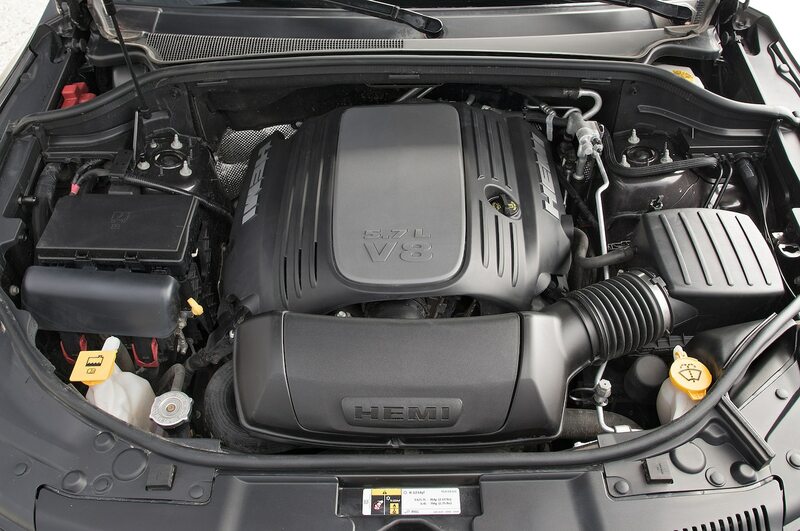 Rechtin added: “The engine delivers sufficient power, but shifts take forever. 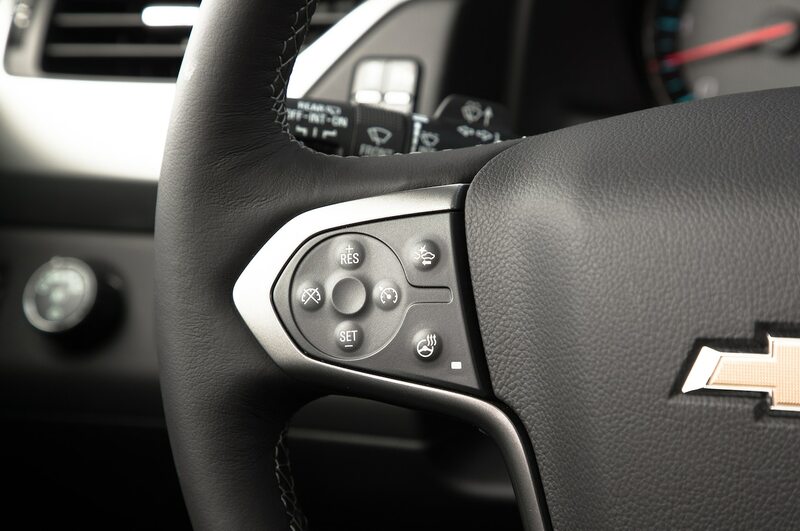 Feels old.” Despite its age, the Toyota can run with the new guys; at the track it accelerates from 0 to 60 mph in 6.8 seconds, and it passes through the quarter mile in 15.2 seconds at 91.6 mph (147.4 km/h). 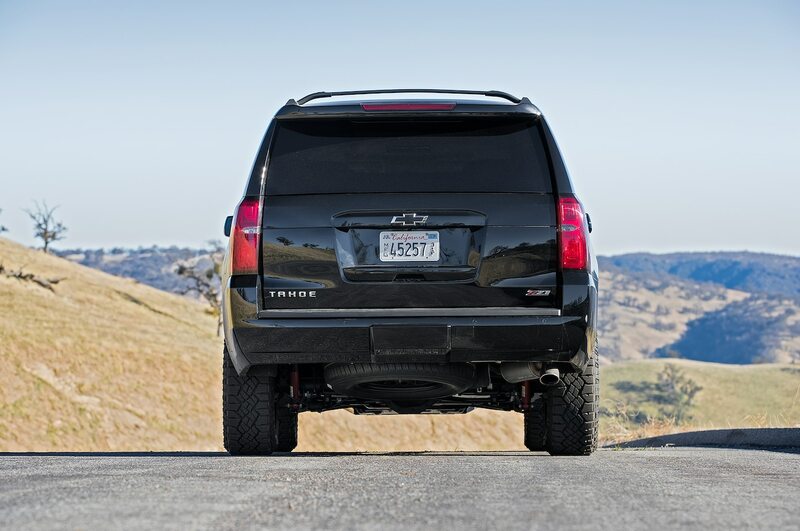 Bringing up the rear is the Chevrolet Tahoe. 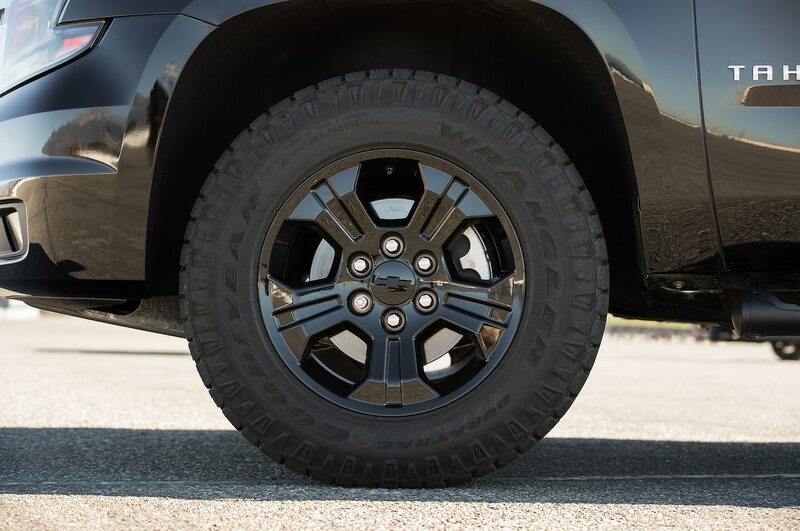 Part of the blame can placed on the Midnight Edition’s all-terrain tires, but the Chevy’s powertrain is equally responsible. 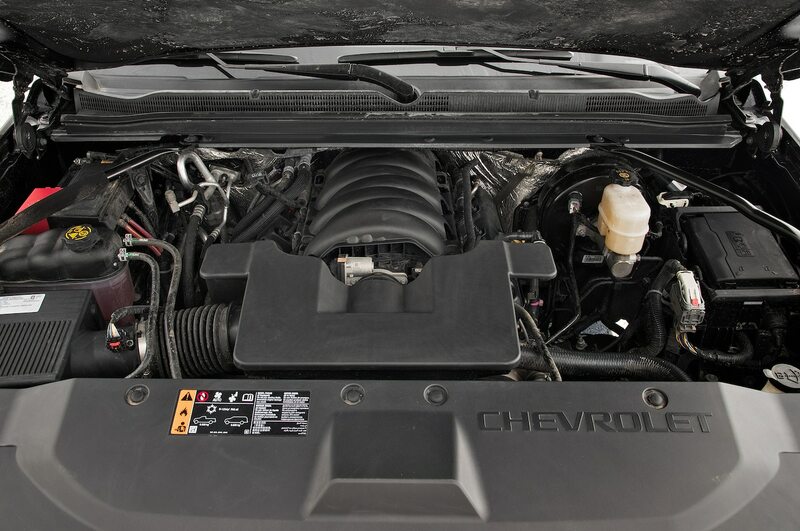 The Tahoe’s 5.3-liter V-8 makes 355 hp and 383 lb-ft of torque, the least amount of horsepower and torque in this field, and despite it being the second-lightest SUV here, its power-to-weight ratio is still the worst in the group. 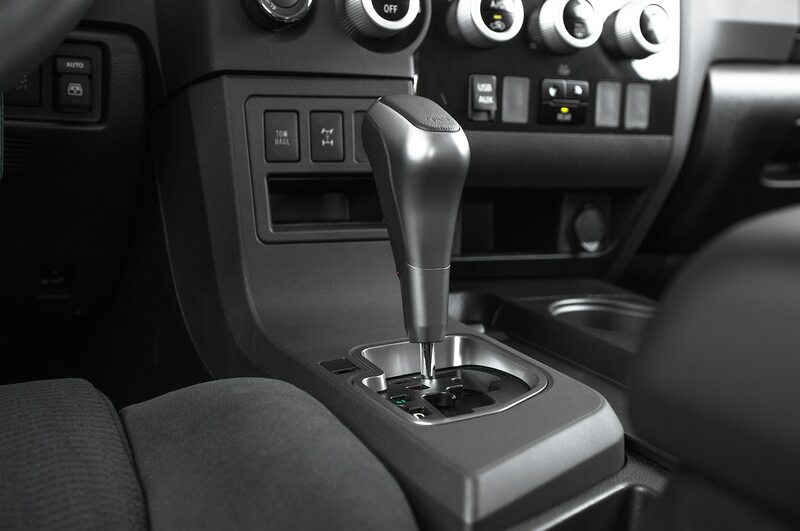 It’s not the engine’s fault; the six-speed under acceleration treats gears two through five like Trump treats Tiffany—it avoids them as much as possible. 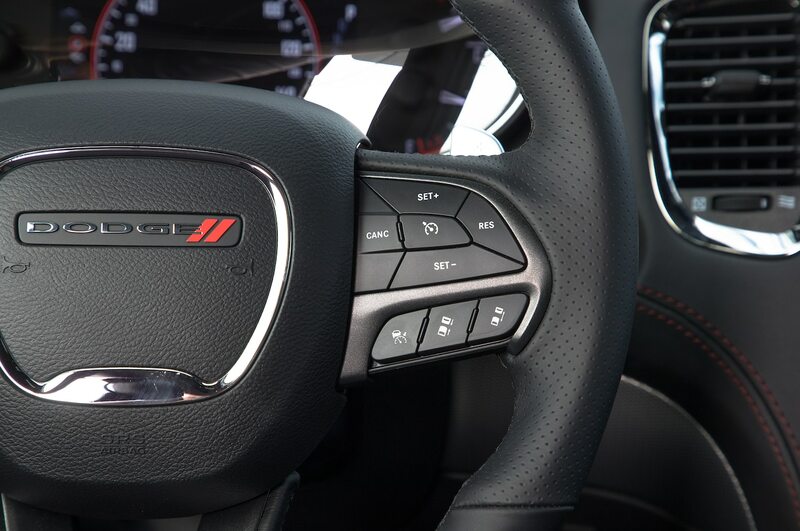 That means less than impressive test results: 0–60 mph comes in 7.9 seconds, and the quarter mile takes 16.2 seconds at 87.9 mph (141.5 km/h). 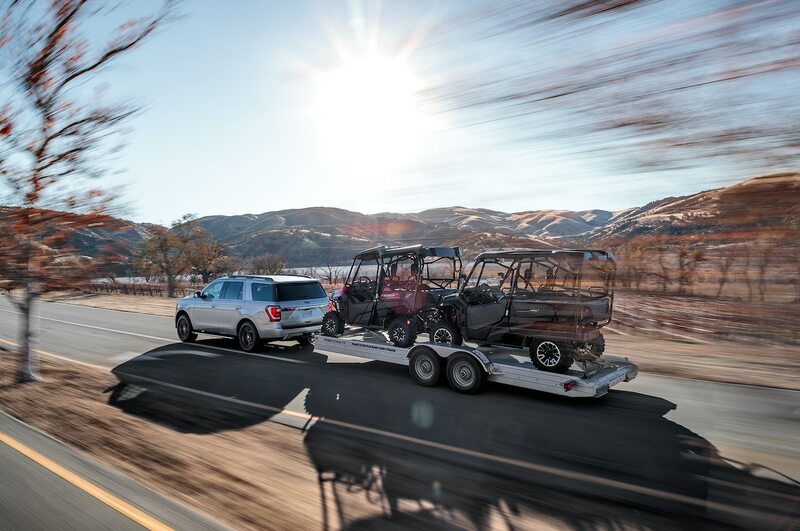 With about half of the buyers in this segment towing at least once per year, we also thought it was important to test how well they towed and hauled. 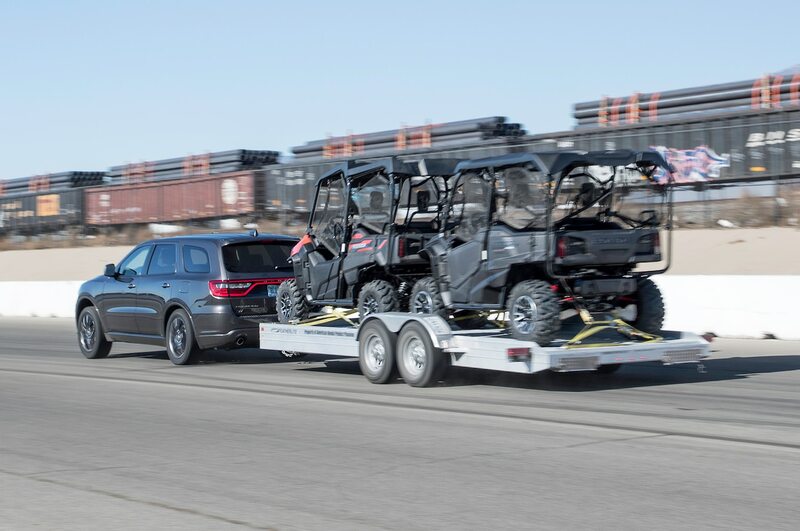 We borrowed a trailer with two Honda Pioneer side-by-sides on it (for a total weight of 4,700 pounds (2,132 kg)) to see how well each handled a load. 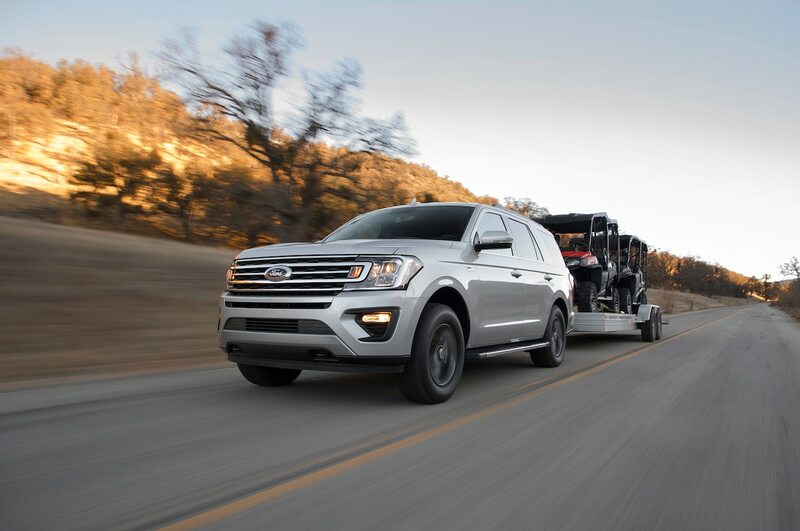 With the Expedition’s highest rated towing capacity—9,200 pounds (4,173 kg)—it’s perhaps unsurprising that it was our favorite hauler. 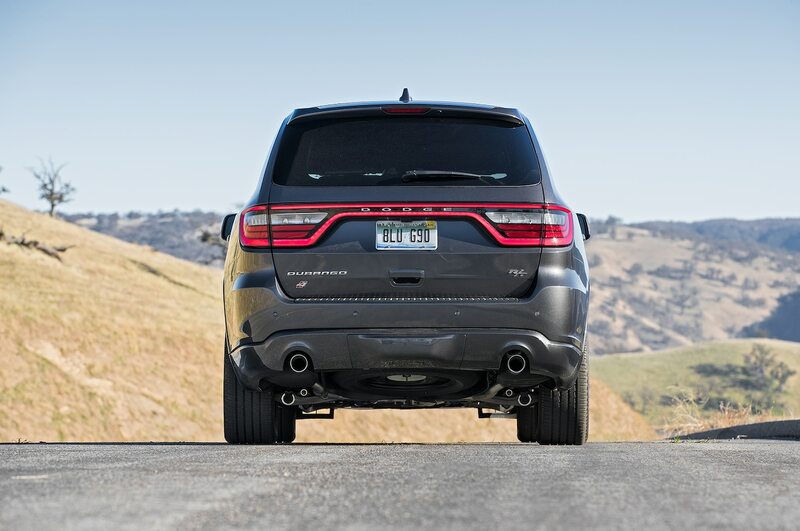 It got up to highway speeds quicker than any other SUV and was the most responsive when passing. “It has tons of pulling power on the inclines, and the powertrain does a good job of engine braking on declines,” Ayapana said. 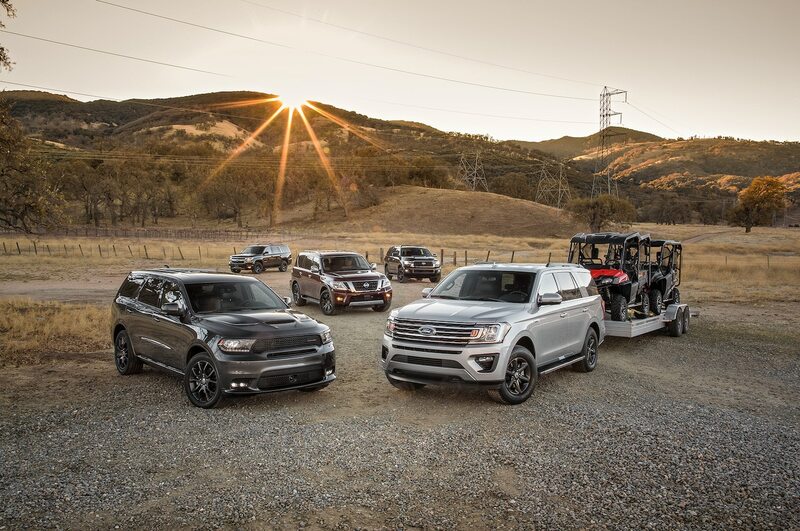 The Armada was a close second choice in our towing tests. 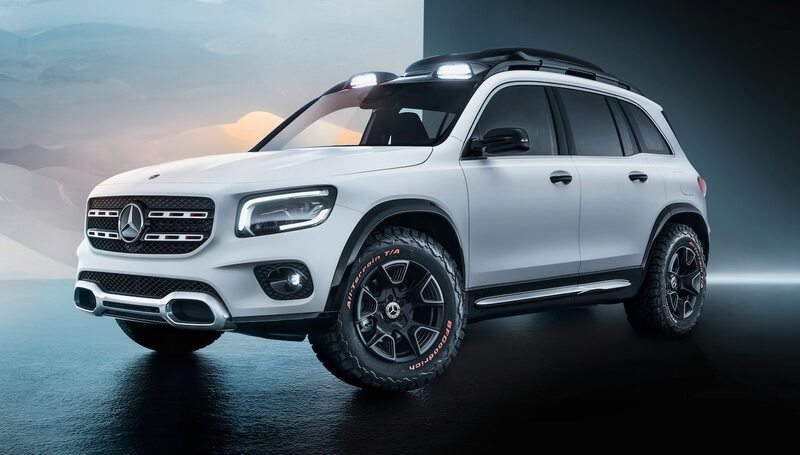 Although most buyers will never take any of these SUVs off-road, their ability to tackle a light off-road course (and, well, a huge mud puddle) directly correlates to how well they’ll be able to handle snow, national park trails, dirt roads, and any other unforeseen obstacle. 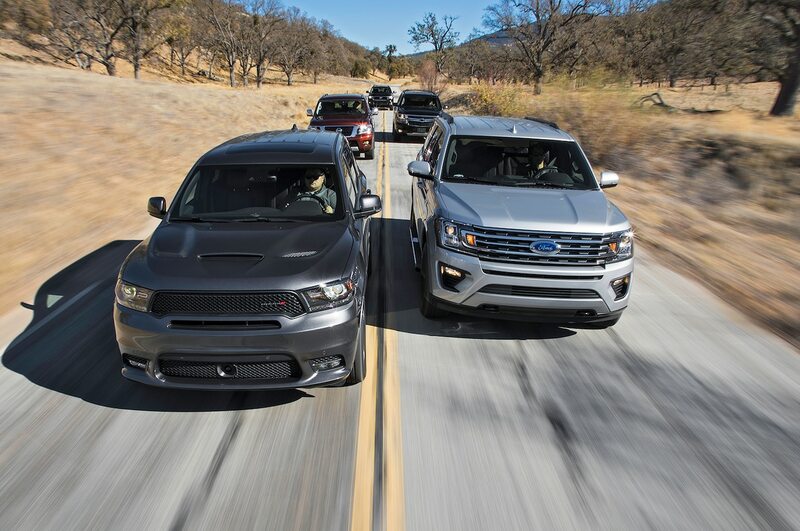 The Expedition and Tahoe, both with off-road packages and tires, hardly blinked in our tests. 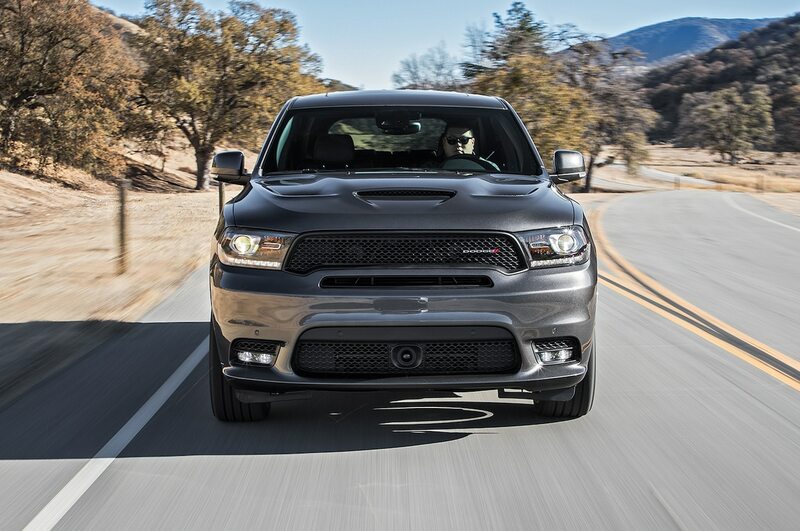 The Durango, too, was shockingly capable, so long as you mind its ground clearance and low-hanging front bumper. 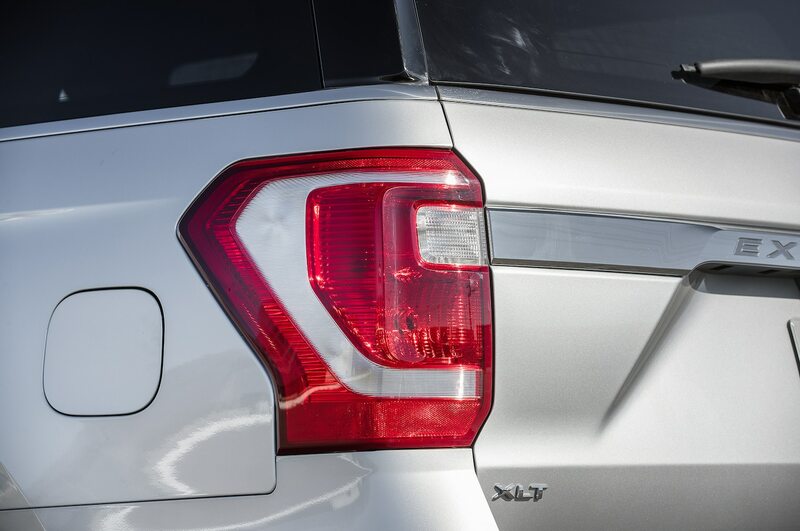 The Nissan and Toyota, on the other hand, were both disappointing. 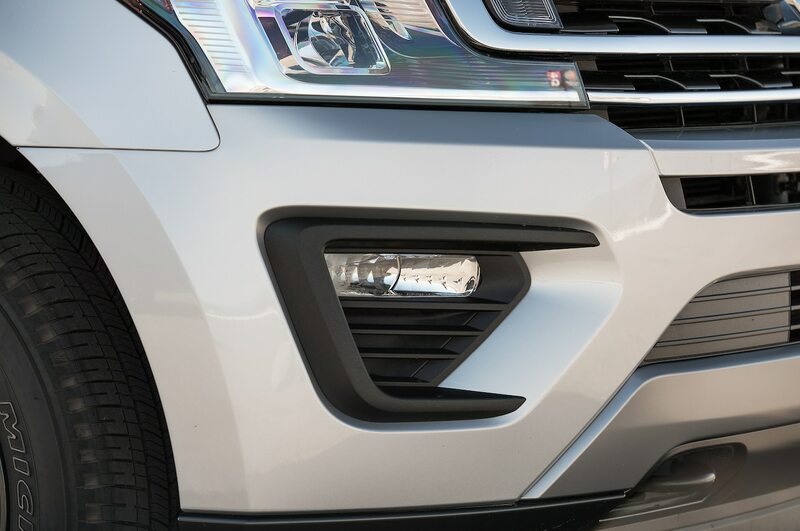 While the three Americans scrambled and crawled through everything we threw at ’em, the two Japanese SUVs struggled a ton, needing four-low in a couple spots. 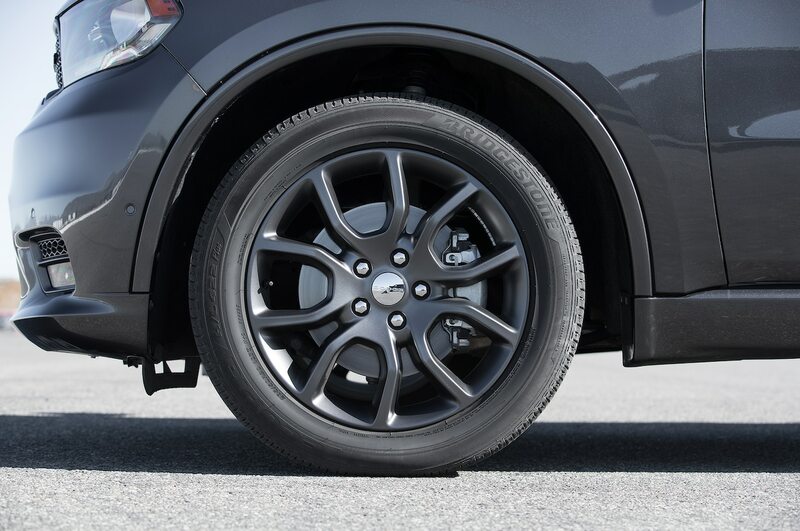 We suspect much of the blame can be placed on crappy street tires, but then again the Durango did just fine. It’s easy to dismiss fuel economy as irrelevant in this segment, but given that California gas prices are back above three bucks a gallon and with an average fuel tank size of 25.26 gallons in this group, frequent fill-ups will be expensive. Sorting by their EPA combined fuel economy scores, the Ford Expedition, with its 17/22/19 mpg (13.8/10.7/12.4 L/100km) city/highway/combined rating, is the most efficient, followed closely by the Chevy Tahoe and Dodge Durango, with the Armada and Sequoia bringing up the rear. 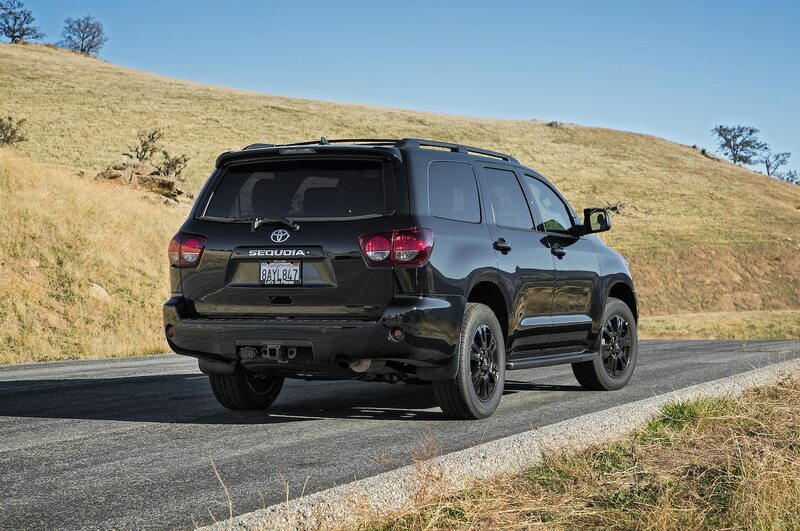 Never content with what The Man tells us, our Emissions Analytics team hooked up their test gear to see how efficient our five SUVs really are, using our Real MPG score. Turns out the feds were right, mostly. 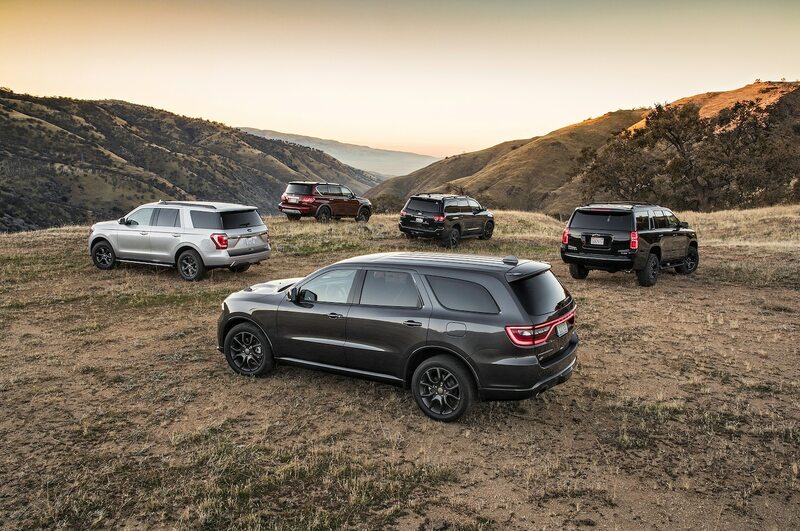 Second, fourth, and fifth don’t change, but the Ford and Dodge swap spots. 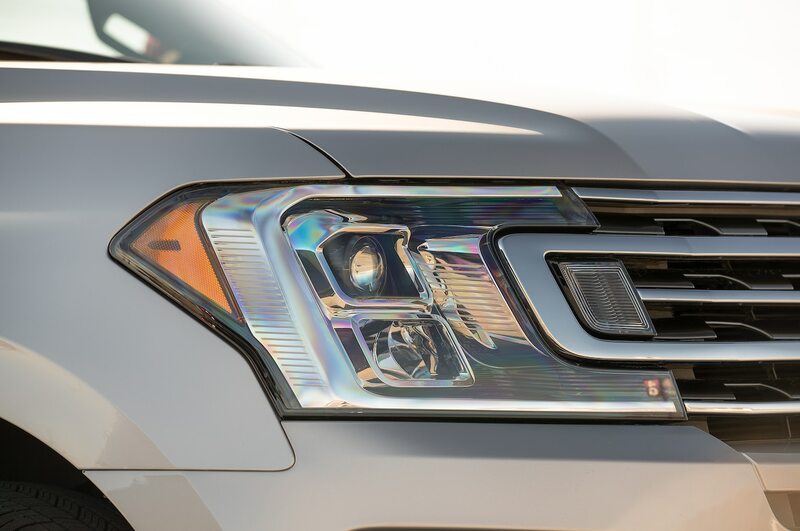 The Durango’s 16.0/25.1/19.1 Real MPG (14.7/9.4/12.3 L/100km) score was the best in the test, and the turbocharged Expedition slipped to third with a 14.6/22.3/17.2 Real MPG (16.1/10.5/13.7 L/100km) score. 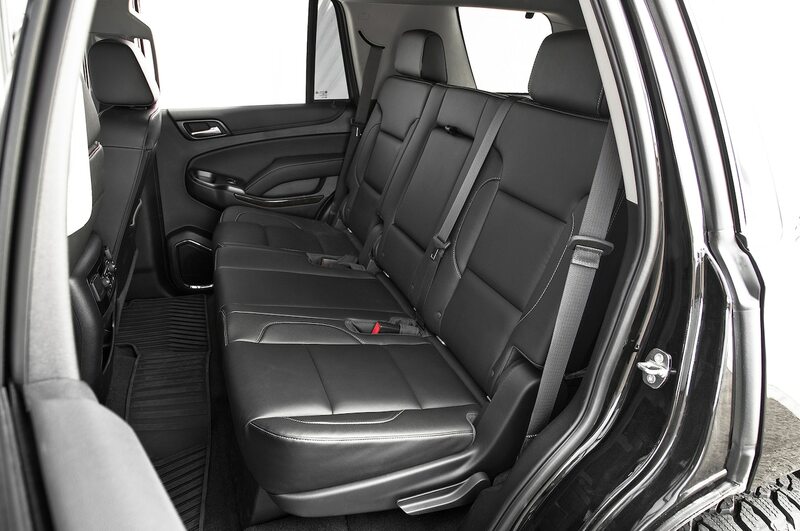 Given these SUVs’ oft-used status as road-trip cruisers and their day-to-day shuttling duties, passenger comfort is a top consideration in our test. 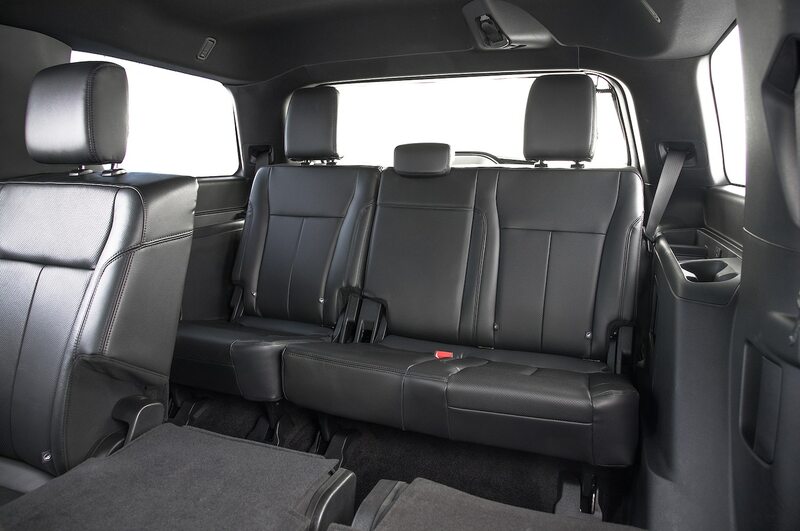 The average commute in the U.S. is 25.4 minutes one way, according to the Census Bureau, and each row of seats is bound to be in use, so we paid special attention to the cabins of each SUV. 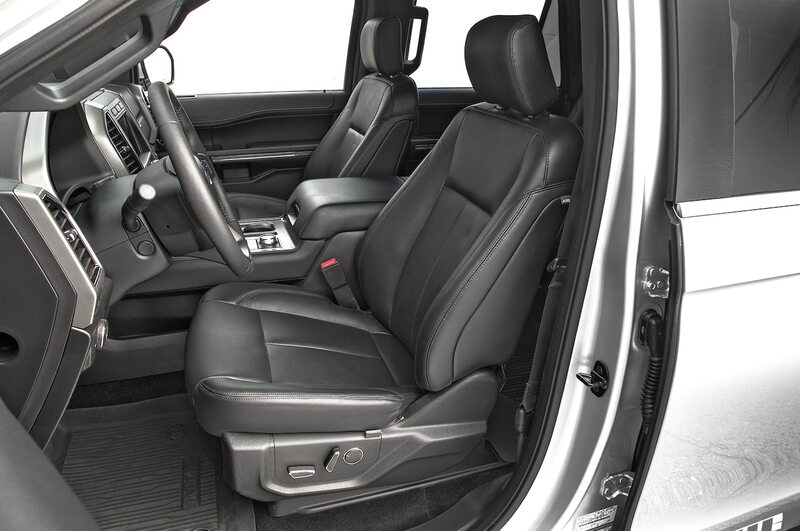 There seems to be a difference in how to approach the cabin from each manufacturer. 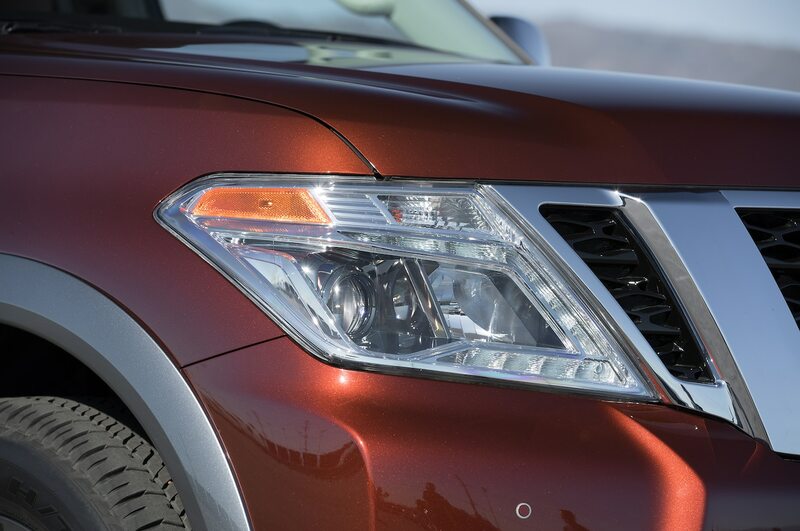 If you want a true luxury experience, you’d seemingly have to look no further than the Nissan Armada. 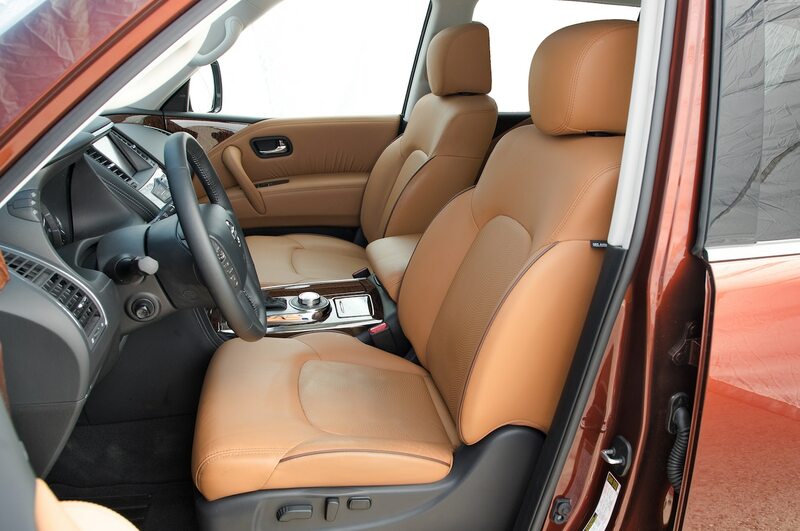 With our Platinum tester featuring swanky burnt orange seats complete with tufted leather door panels, the Armada makes a great first impression. 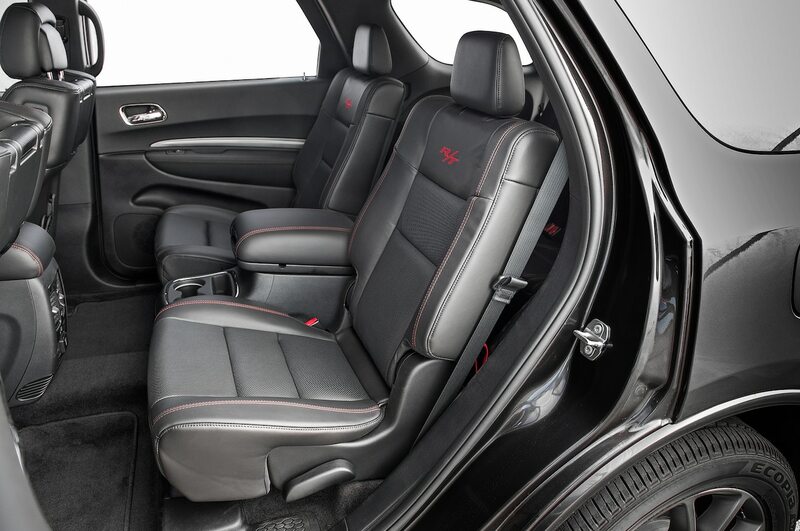 The seats are comfortable, and the first two rows are spacious. Things fall apart from there, though. 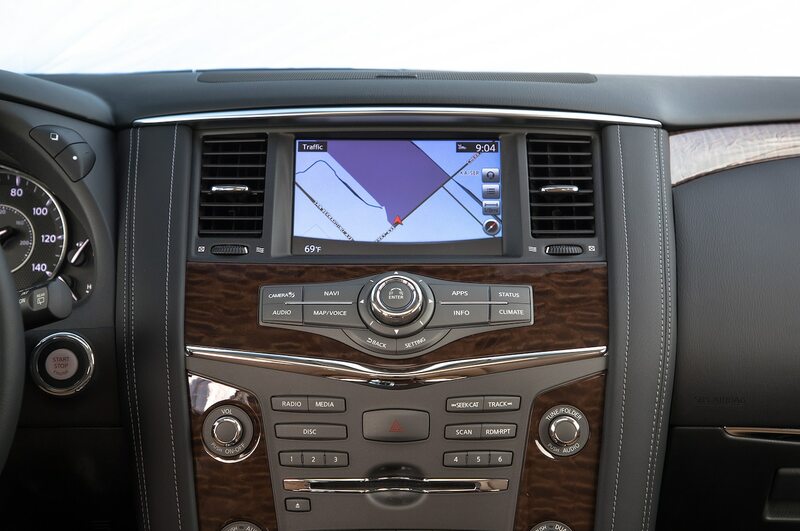 “This is the most luxurious interior, even if it’s last-gen Infiniti,” Evans said. 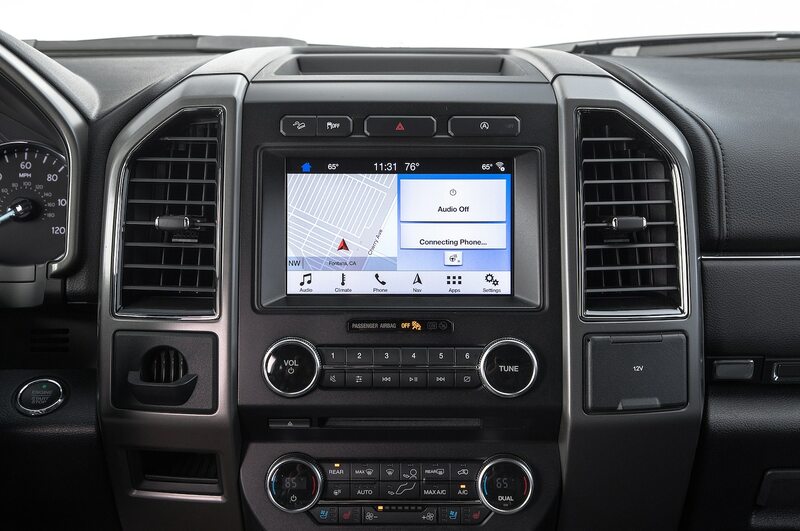 “Most people won’t know that, but they will notice the tiny black-and-white screen in the cluster, the busy, button-crazy center stack, and the small infotainment screen with dated graphics.” The infotainment system isn’t the only thing leaving us scratching our heads; the Armada’s third row is by far the smallest of the group. Anyone larger than a small child will have their head brushing the low ceiling, headrest digging into their spine, and knees in their chest. 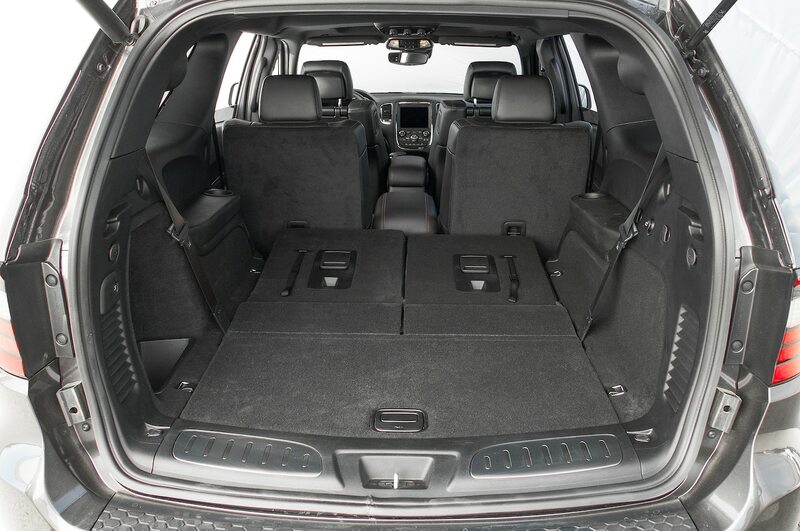 The Tahoe keeps the Armada company when it comes to scant third-row space and comfort (though the Chevy’s is slightly more humane), but is a remarkably well-executed package otherwise. 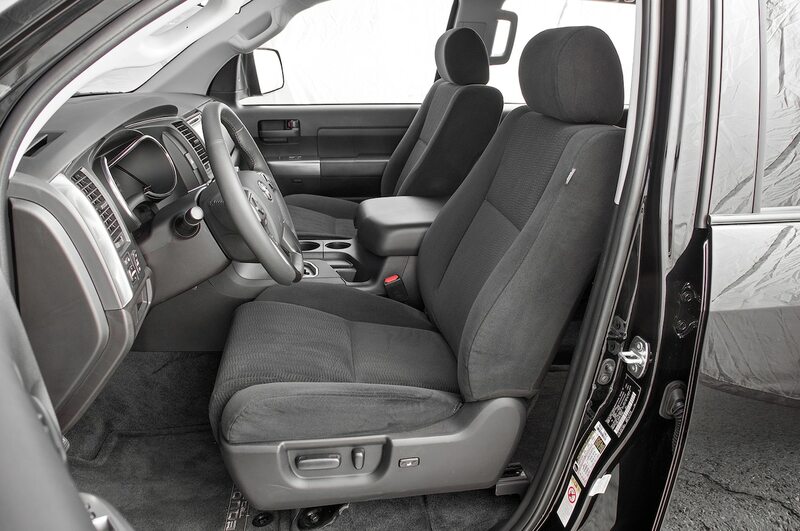 “The Tahoe’s interior is my favorite part about it,” Nishimoto said. “It looks modern, and the materials feel nice for this class. 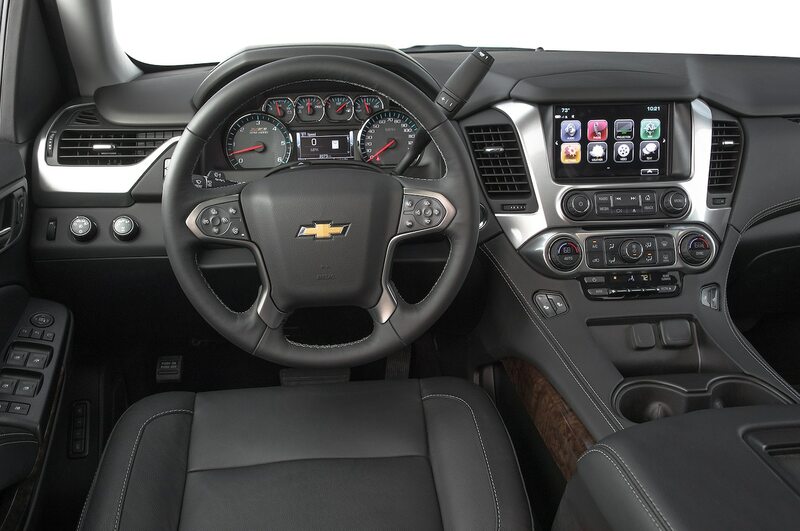 There are plenty of USB ports throughout the cabin and little storage areas, too.” The Chevy also features a snappy Apple CarPlay-friendly infotainment system and a Wi-Fi hot spot to keep everyone occupied on road trips. 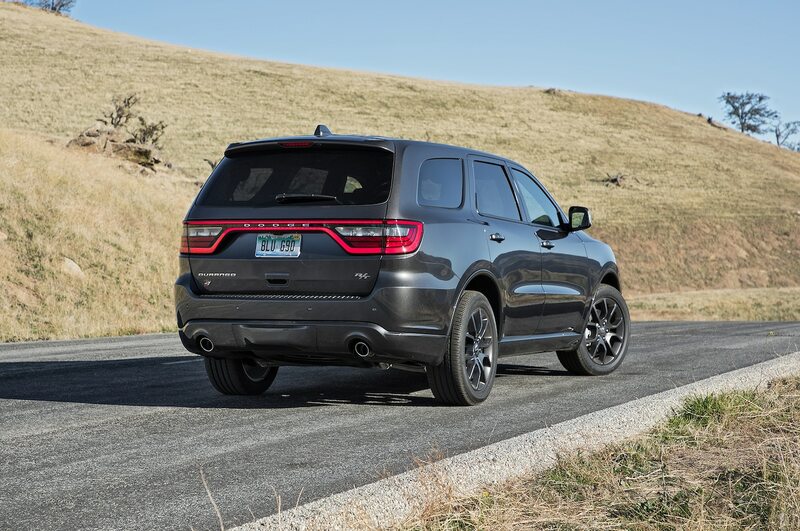 The Dodge Durango is the smallest SUV here, but you wouldn’t necessarily know it inside. 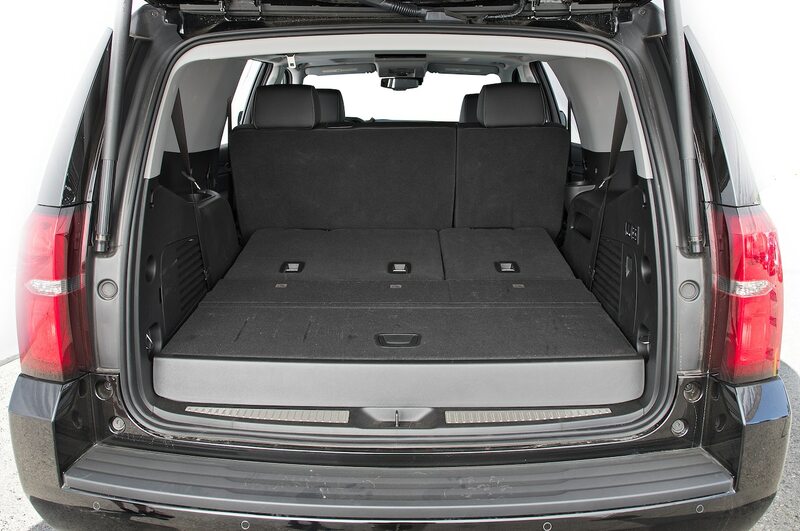 Due to some impressive packaging wizardry, the Durango’s three rows and cargo areas all sport middle-of-the-pack space while still having city-friendly dimensions. 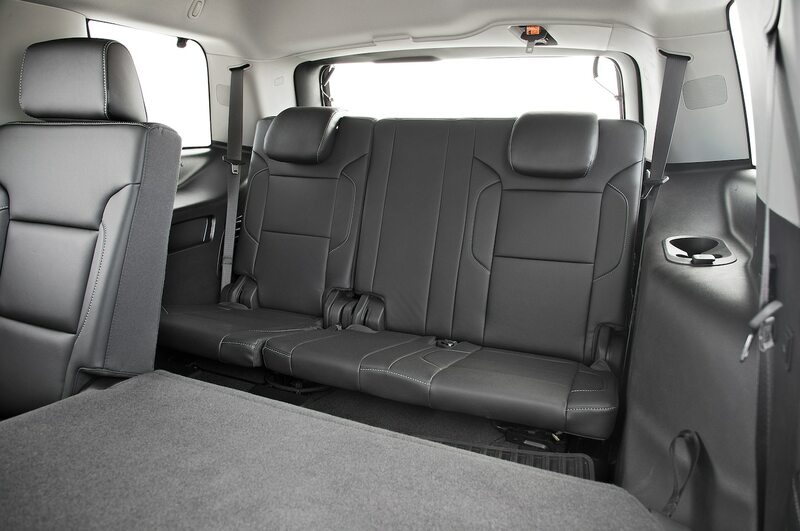 The second row is slightly smaller than the rest of the pack, but it still feels plenty roomy and comes with all the creature comforts you’d expect. 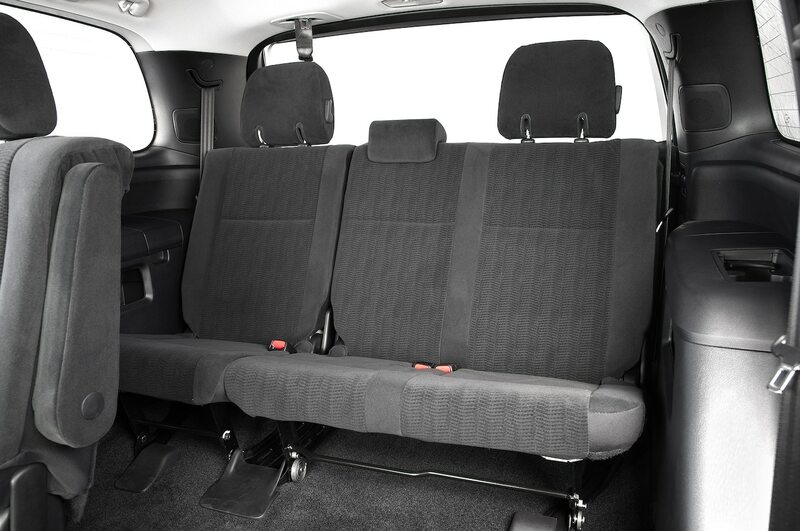 The third row is accessed pretty easily and can fit adults in a pinch. 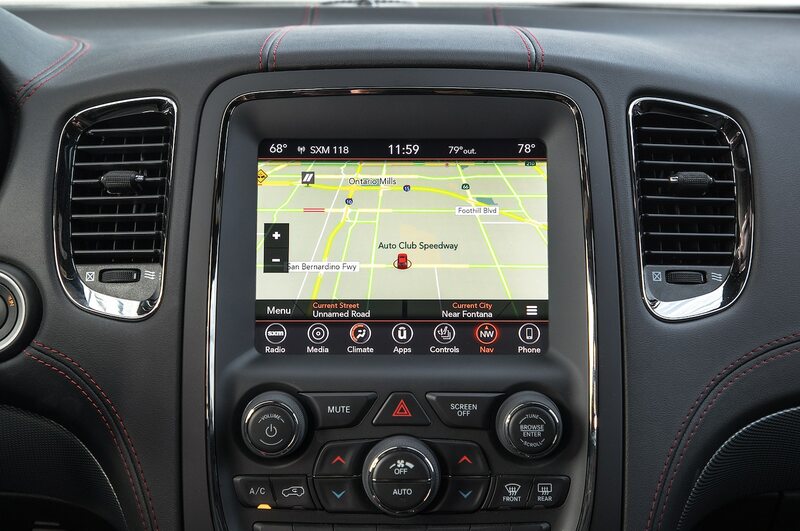 We also really liked Dodge’s CarPlay-friendly infotainment system, which is the most feature-rich of the group. There’s still some room for improvement, though. 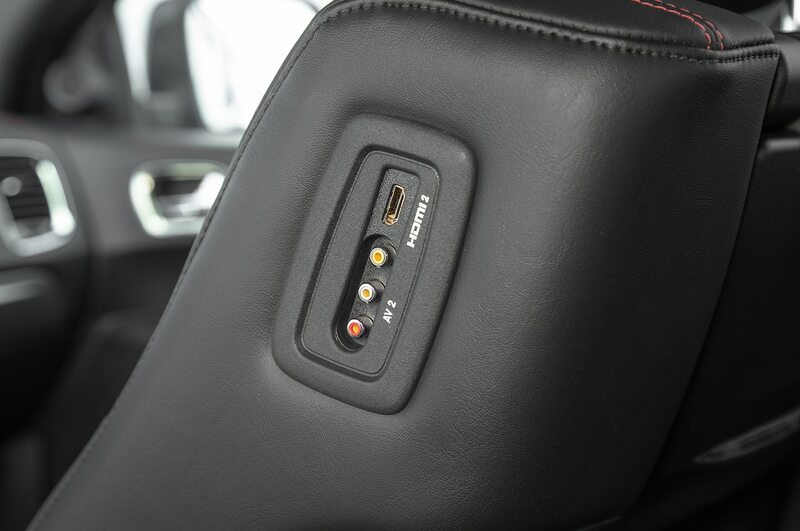 The optional rear-seat entertainment package puts a Blu-ray player in the front center console, which eliminates any storage capability it once had, and the third row is just one of two here without any USB outlets to charge up devices. 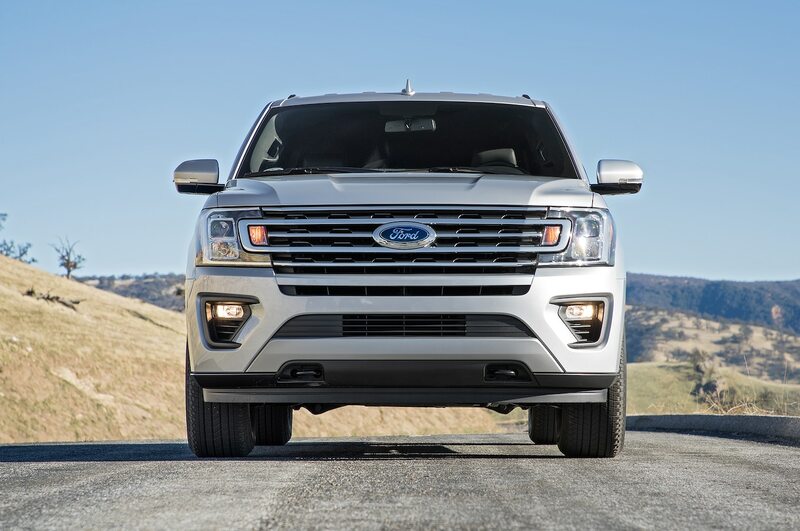 The Ford Expedition seems to benefit greatly from being the newest SUV of the bunch—it’s the only one to effectively blend passenger comfort with interior features. 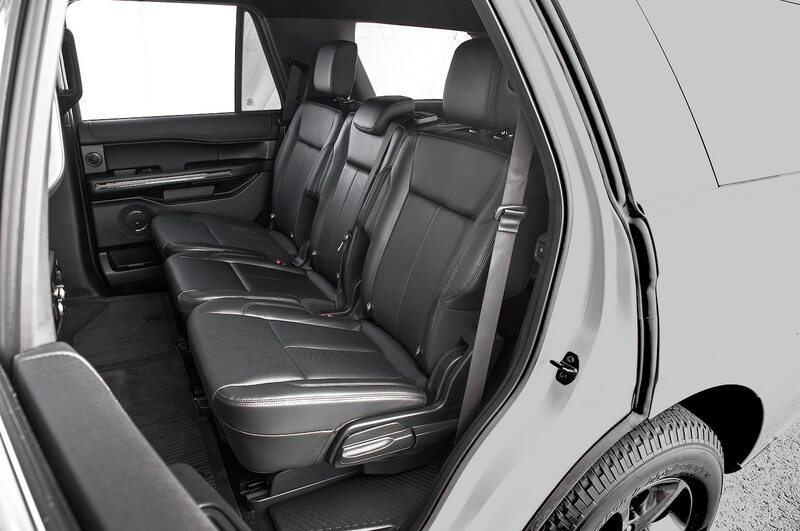 The F-150-inspired cabin features huge storage cubbies, plenty of cupholders, and plenty of room for adults and their cargo in all three rows. 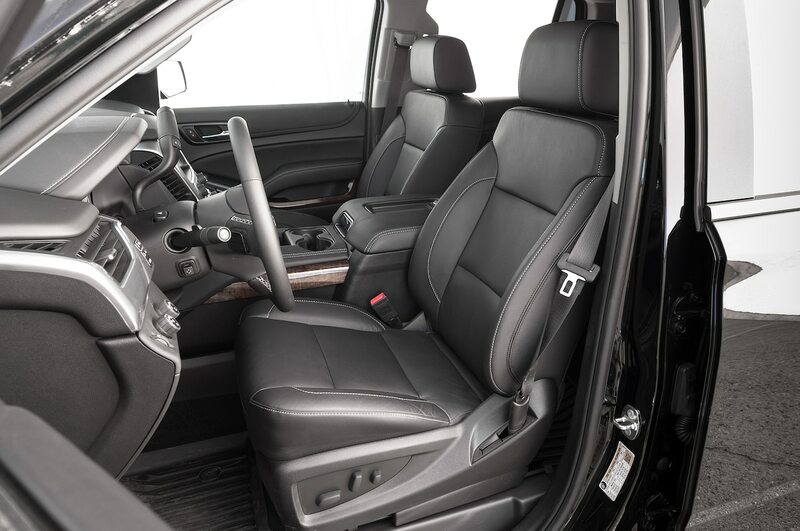 Both the second and third rows tilt back and recline, and the Ford won praise for how easy it is to access the third row; the second row slides forward and out of the way with a light touch. 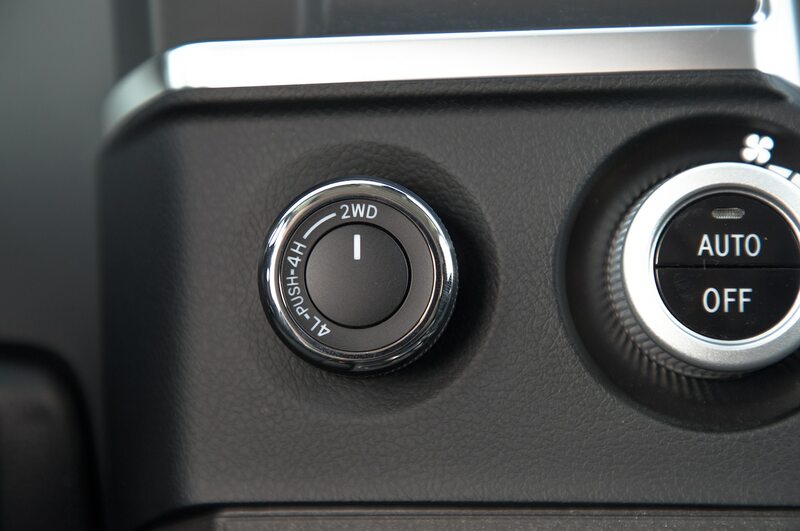 This being a 21st century SUV, each row of seats gets plenty of power ports, USB outlets, and storage cubbies, and second-row passengers also have the ability to control infotainment functions from the back of the center console. 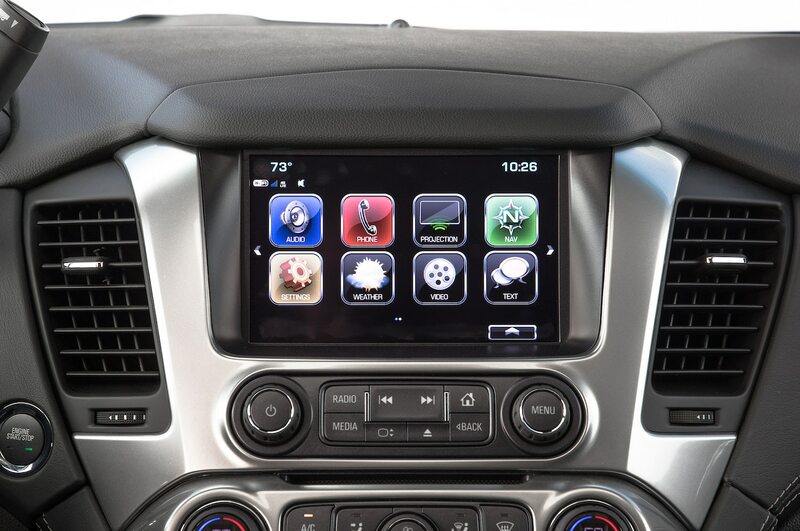 And yes, there’s CarPlay integration. 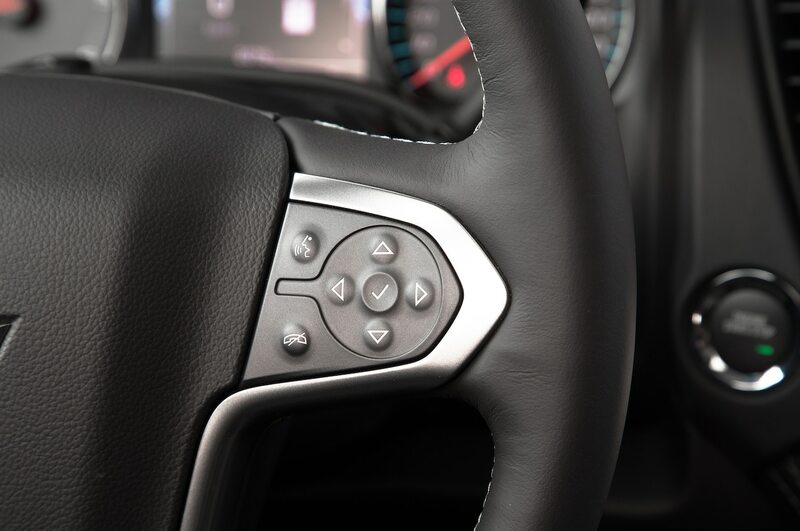 There are two ways of looking at safety in this segment—crash test scores and active safety tech. 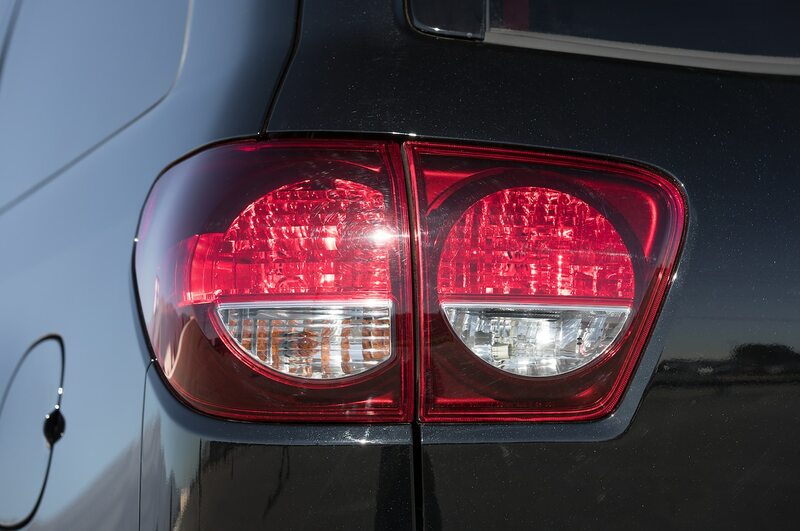 On the former front, we have an incomplete set of data because three-fifths of our field hasn’t been tested yet by the National Highway Traffic Safety Administration (NHTSA) or the Insurance Institute for Highway Safety (IIHS). 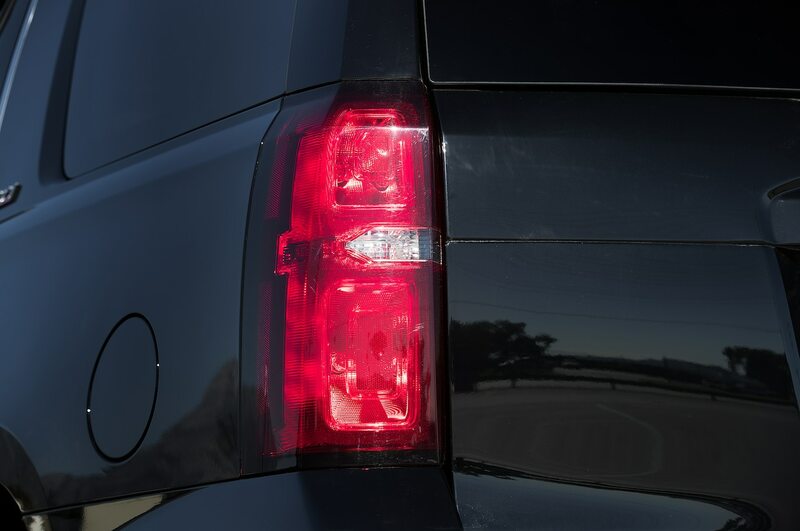 The Tahoe has been tested by NHTSA, scoring four stars out of five overall, and the Durango is rated four stars overall by NHTSA and scored “Good,” the highest possible rating, in most IIHS tests. 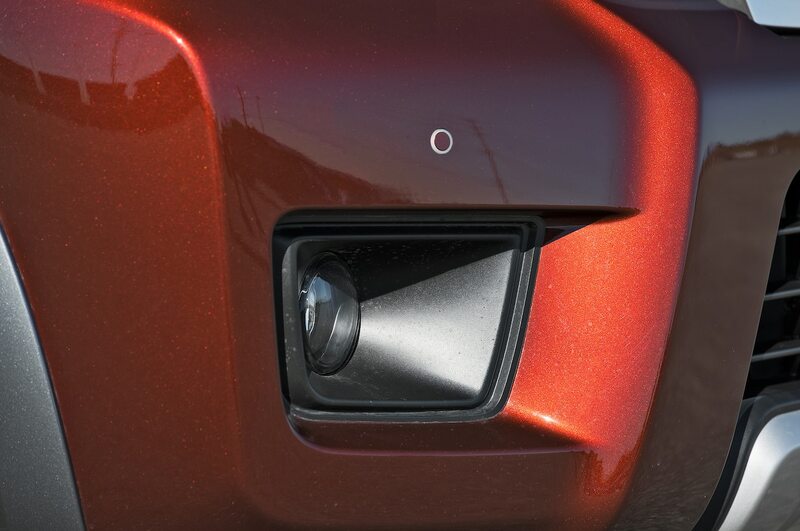 On the active safety front, each vehicle here sports some sort of technological measure designed to make you a safer driver, such as blind-spot warning or rearview cameras. 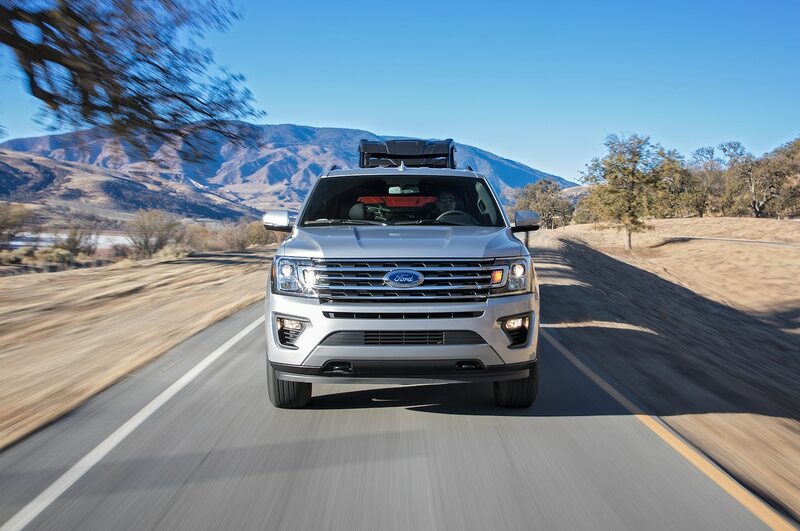 Aside from the Ford, whose sole set of supplemental safety tech was limited to blind-spot monitors and a backup camera on our base-level Expedition XLT (forward collision alert, adaptive cruise control, and lane keep assist are available on higher-spec models), most of the other systems functioned without having to think twice about them—a skydiver wouldn’t want to think twice about their parachute, would they? 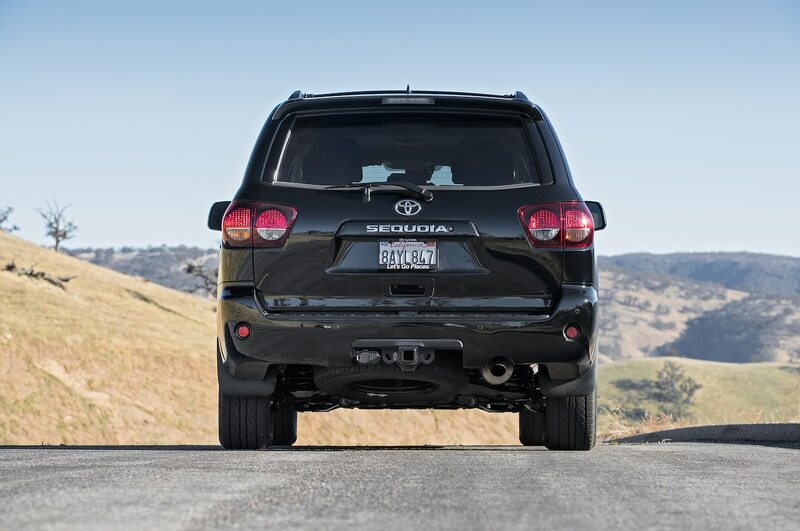 The two minor gripes we had were with the Armada and the Sequoia. 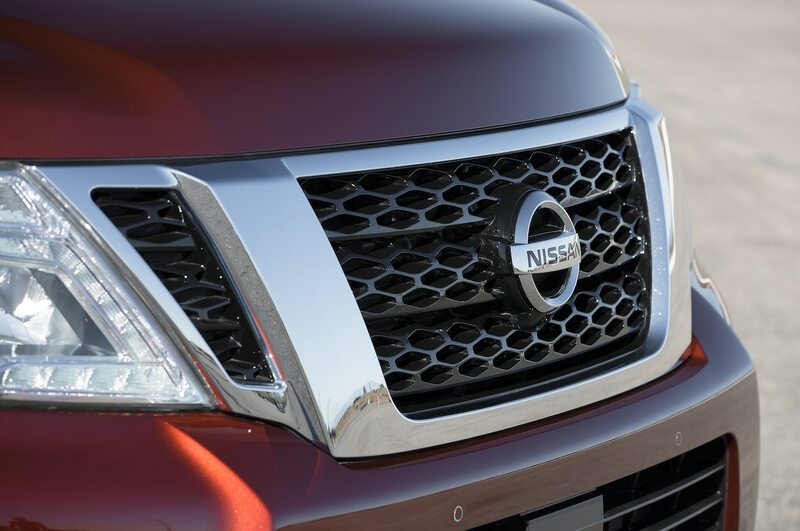 The Nissan, which has the most comprehensive safety tech, would regularly slow down in heavy traffic, thanks to its Intelligent Distance Control software. 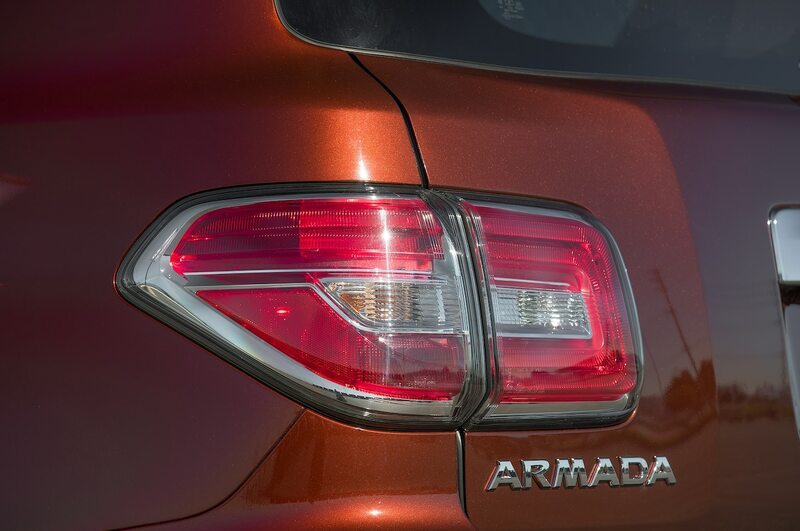 But once the slow traffic cleared, the Armada’s smart-cruise system was scarily poky at getting the Nissan back up to speed. 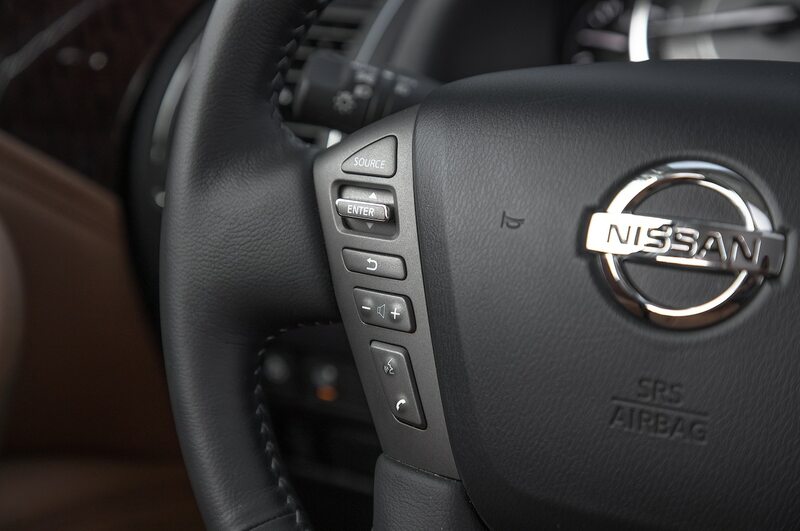 We’d have turned it off, but good luck navigating through the Nissan’s digital instrument cluster in traffic. 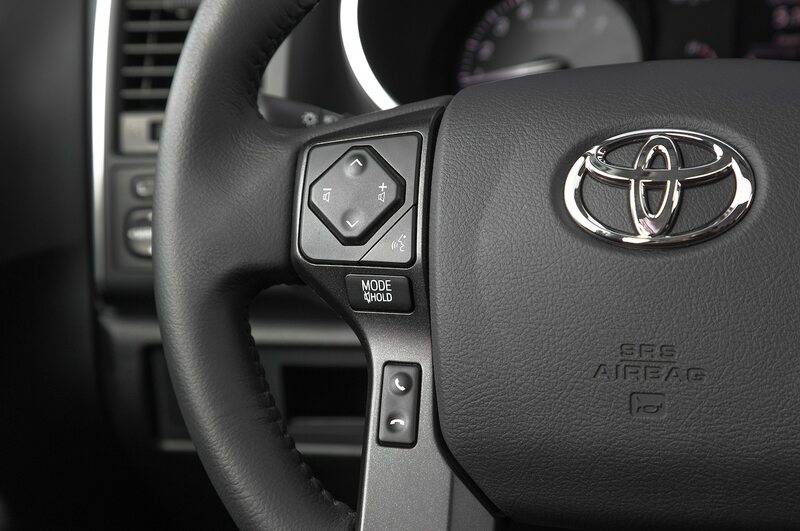 As for the Toyota, well, its lane keep assist software doesn’t seem to do anything other than mindlessly beep at the driver, prompting all of us to shut it off. 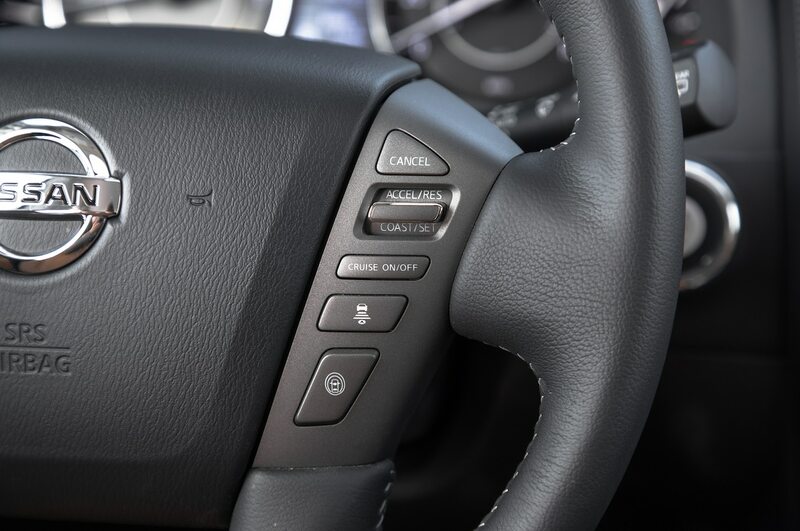 A turned-off safety system doesn’t do anybody a lick of good. Value’s a touchy subject. To some, it’s all about price. 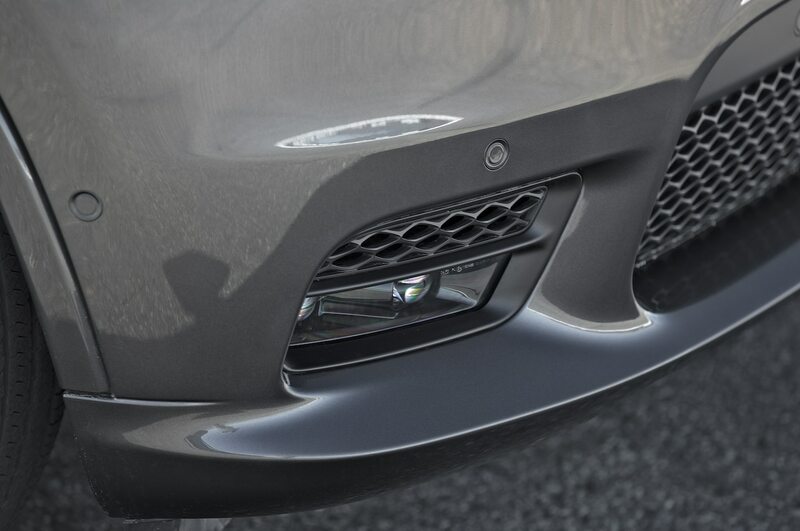 To others it’s about features or space. 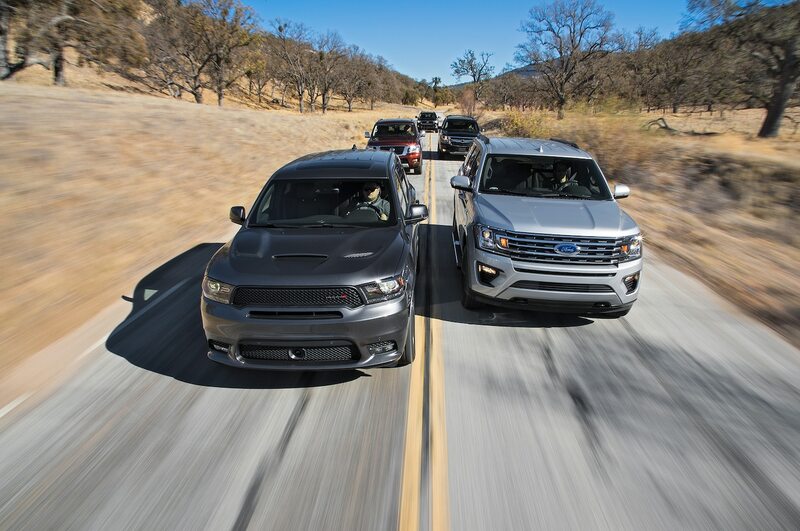 It’s hard to ignore the value proposition of our two cheapest entrants, the $55,535 USD Toyota Sequoia TRD Sport and the $56,555 USD Dodge Durango R/T. 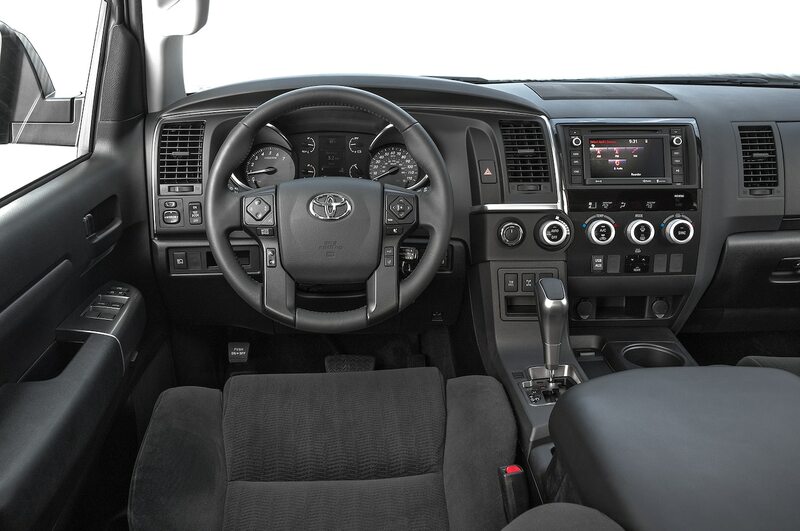 The former offers up the most interior space for the price, though you get little else for your money. 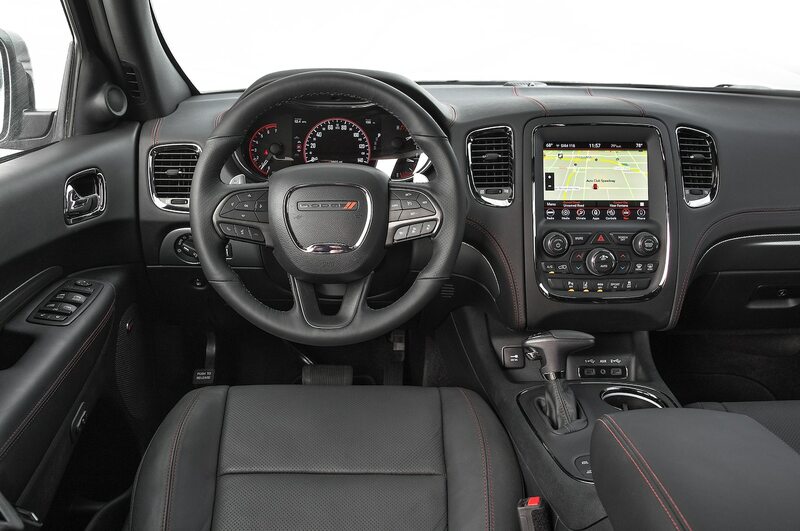 The latter offers up a reasonably roomy interior, plus leather, adaptive cruise control, lane keep assist, a premium audio system, and Apple CarPlay and Android Auto compatibility. 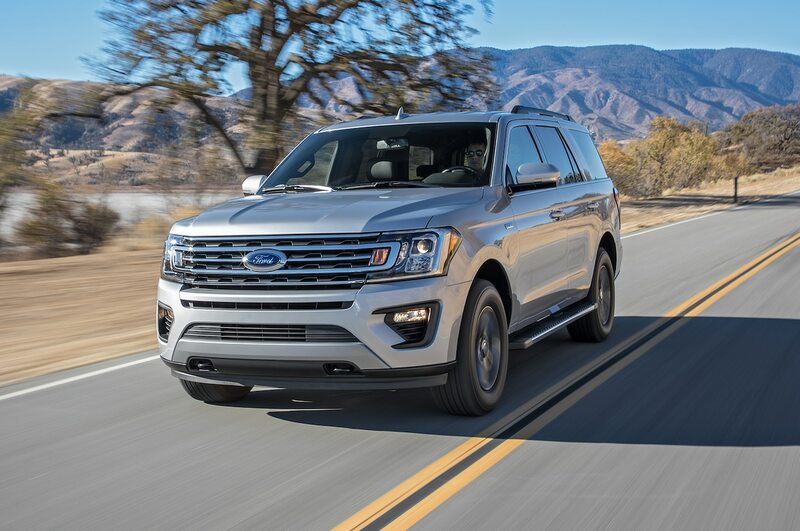 Although more expensive than both the Dodge and Toyota, we found the $64,220 USD Ford Expedition XLT offered up the best balance of interior room and creature comforts. There are a lot of different ways of looking at cost of ownership, so I highly recommend checking out our Intellichoice-sourced chart for the full cost of ownership breakdown. 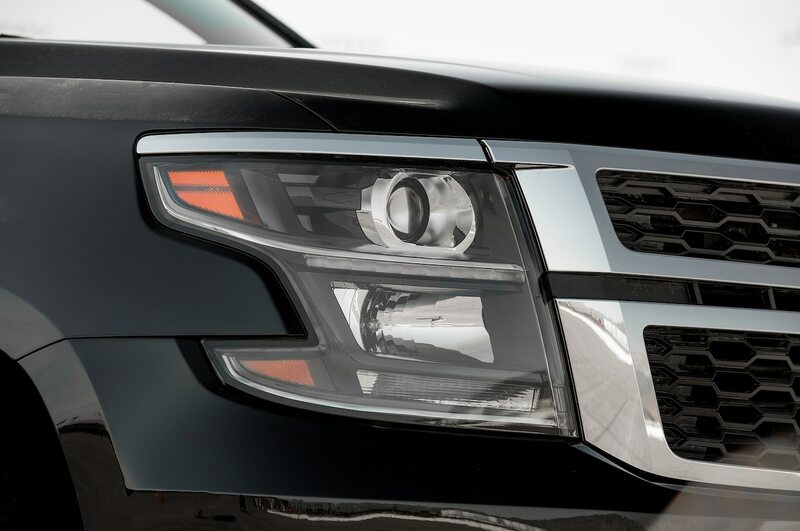 If we focus solely on how much each vehicle will cost to run and maintain over five years, the Tahoe comes out ahead at $25,396 USD over 60 months, with the Expedition close behind at $25,636 USD. 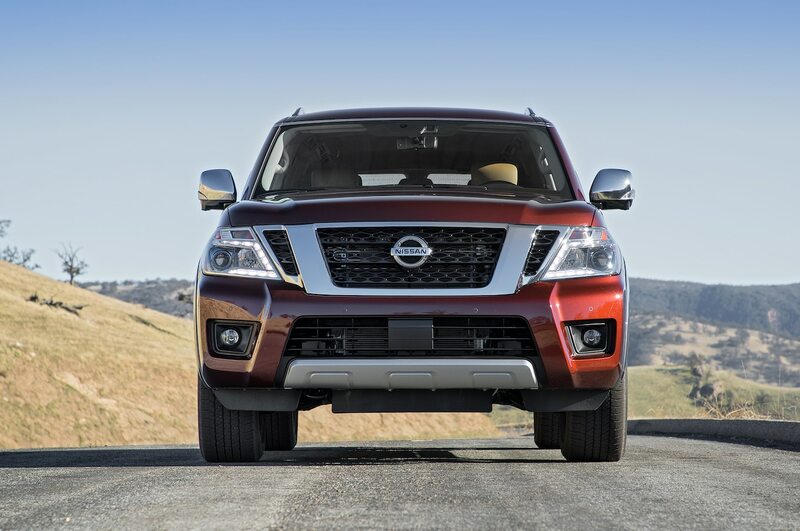 The Toyota and Dodge barely lag behind the Chevy and Ford, but the Nissan handily brings up the rear, its high insurance, fuel, and repair costs giving it a $31,849 USD cost to owners over the same use period. 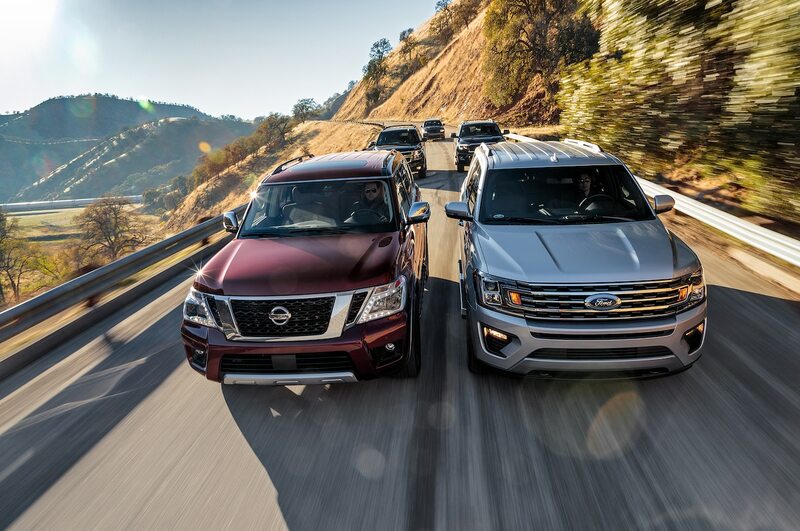 Ultimately, when it came down to deciding which SUV best balanced overall performance and road manners with packaging, fuel efficiency, and value, our individual rankings largely mirrored one another’s. 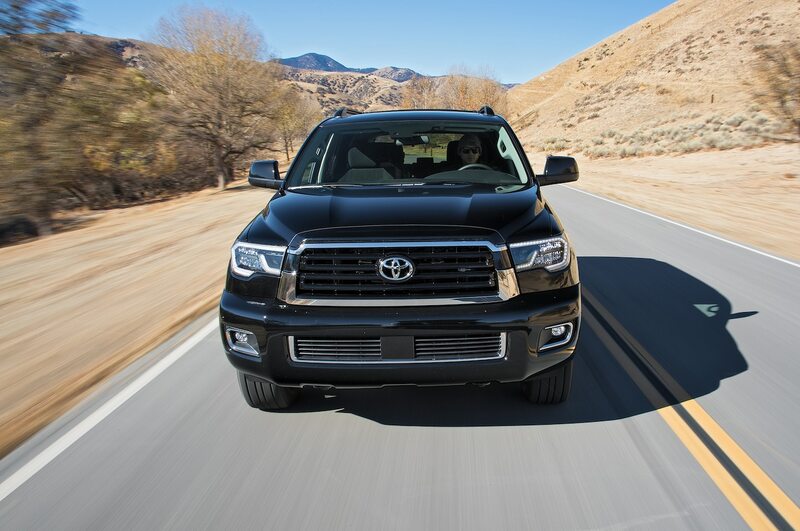 Last place goes to the Toyota Sequoia. 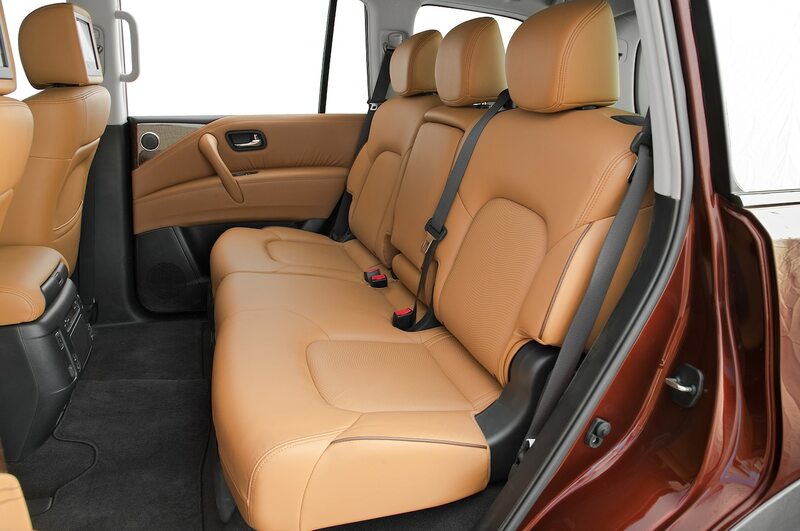 We all liked how roomy its cabin was, but that’s about it. 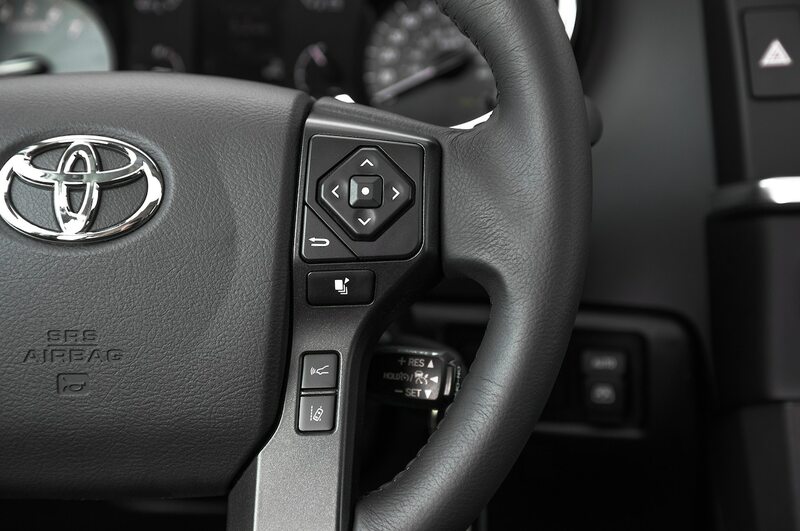 Everything about the Toyota feels old, from its road manners to its interior design and materials choices. It’s the cheapest truck here, but your money goes a lot further with the rest of the pack. As Evans puts it, our second-place finisher punches way above its weight. (What’s with all the sports analogies?) 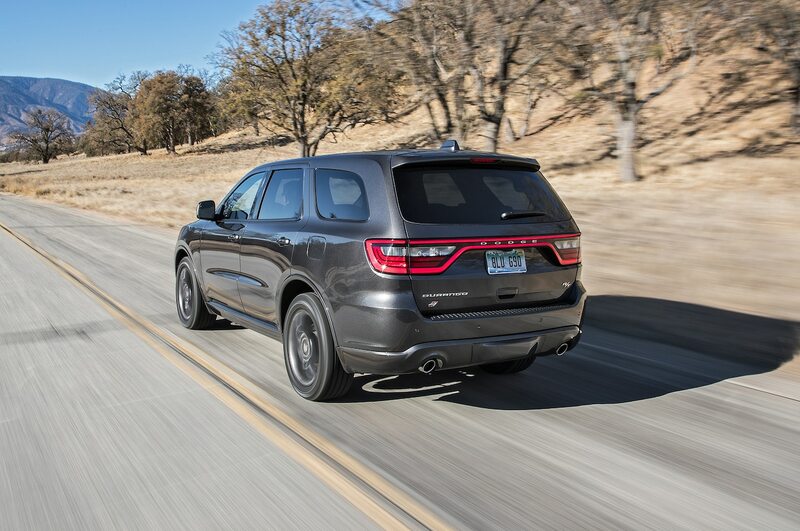 Despite being the smallest vehicle here, the Dodge Durango still does everything nearly as well as our first-place finisher at a bargain price. 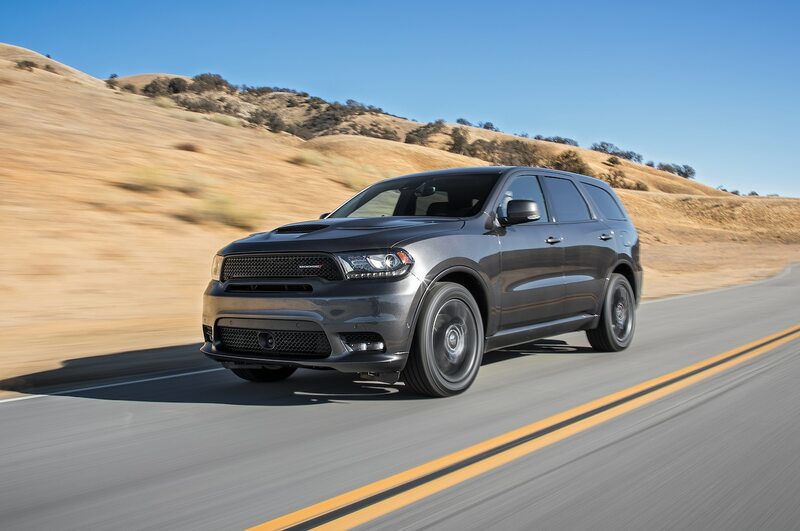 The Durango feels both sporty and upscale, it’s efficient, and it’s safe, but its slightly smaller cabin and higher running costs means it just misses out on first place. 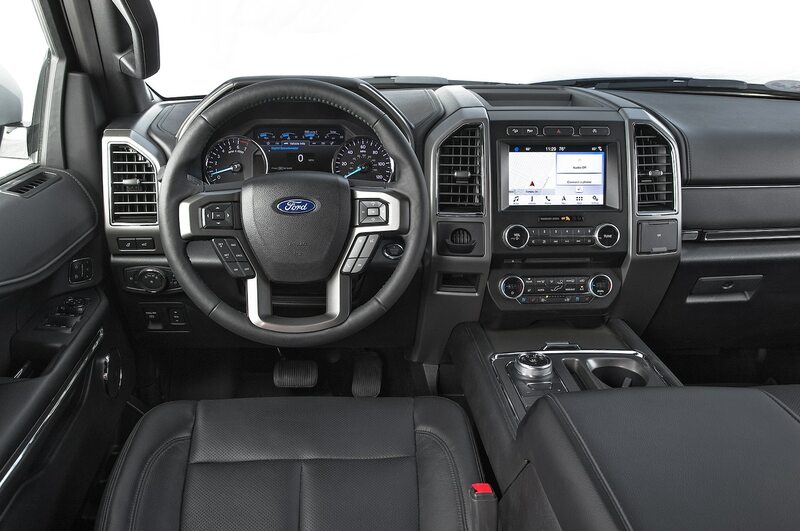 The Ford Expedition is a true jack-of-all-trades. 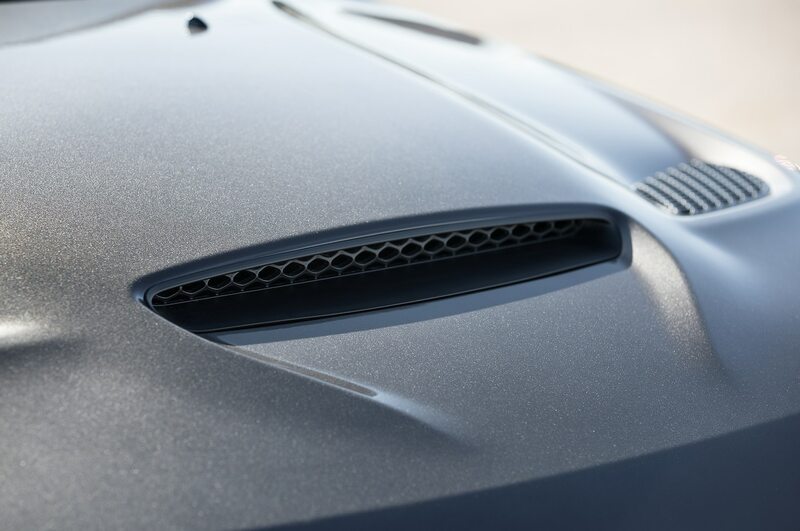 It’ll do anything its owner could ever ask of it without breaking a sweat. 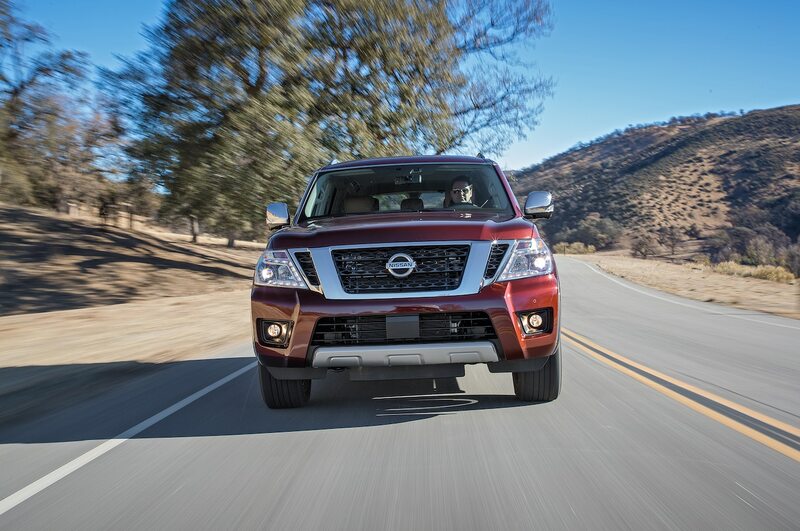 It expertly balances city and highway drivability with off-road capability and segment-leading tow capacity. 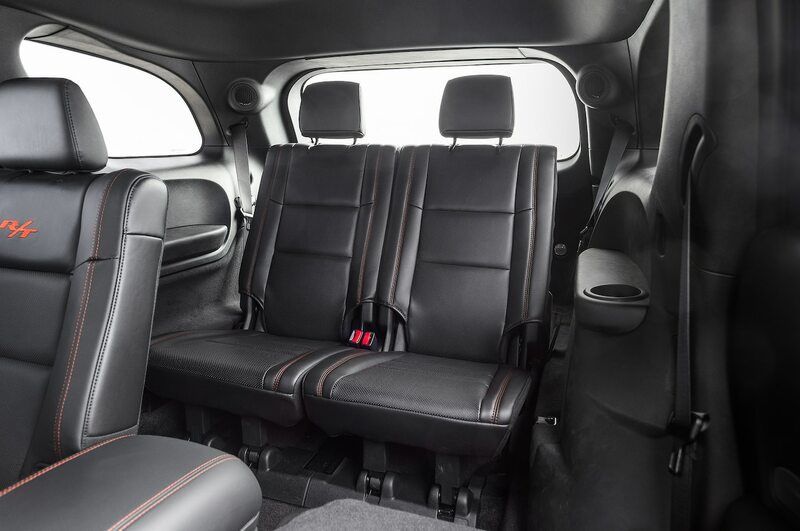 It has more room inside than a New York studio apartment, features a modern infotainment system, and is among the most efficient and cheapest SUVs here to run over the long term. 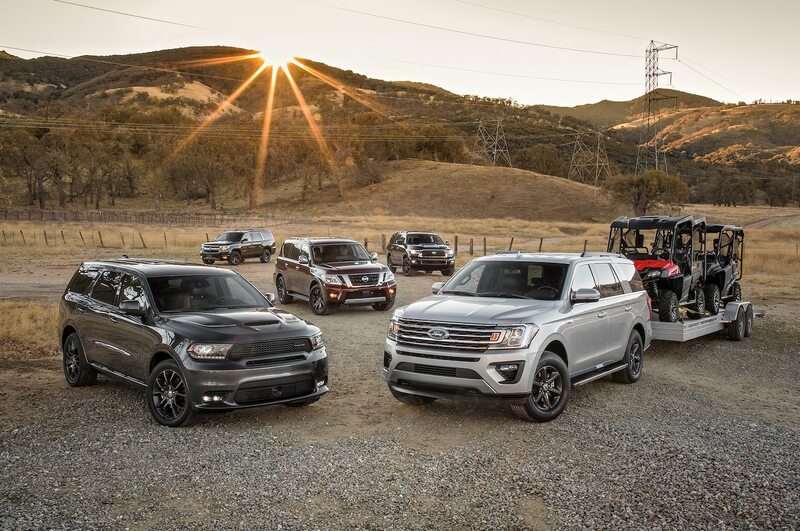 Whether working or playing, the Ford Expedition is a game changer in the segment, and it’s our unanimous pick for winner of this Big Test. 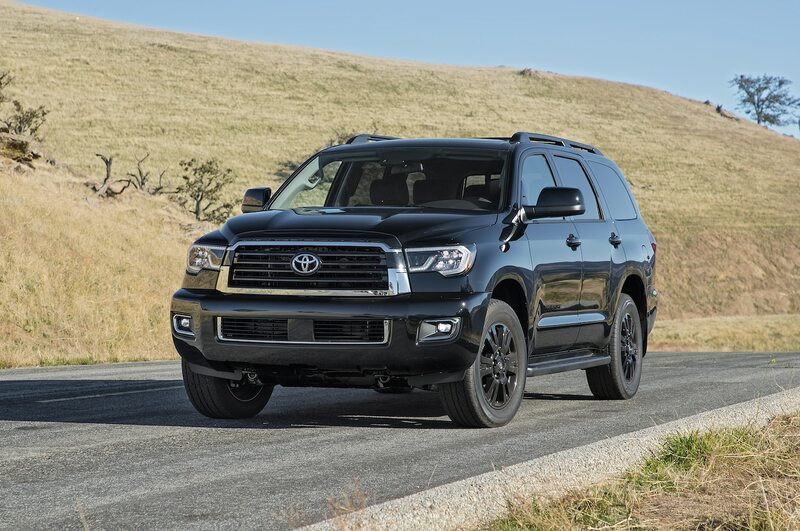 5th: Toyota Sequoia TRD Sport 4WD Ten years old and feels every year of it. It’s big and cheap. If that’s all you need, you’ll be OK. But don’t go looking for more here. 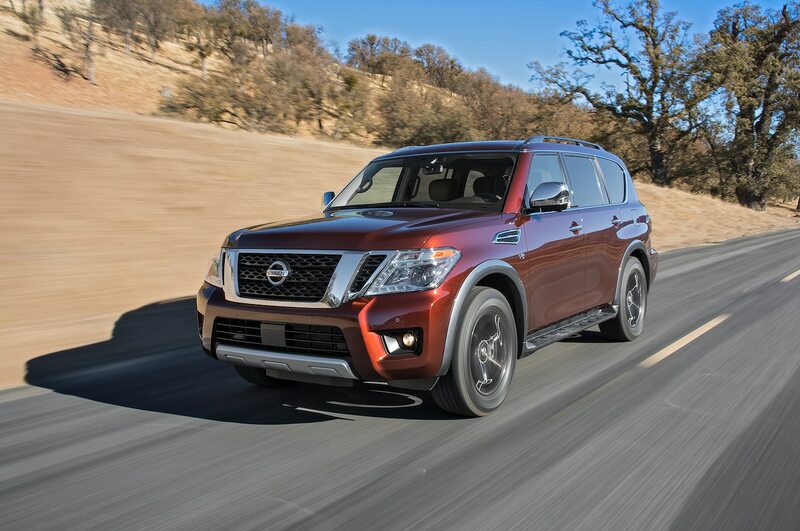 4th: Nissan Armada Platinum 4WD Despite its comfortable ride and prompt powertrain, its useless third row, maddeningly complex electronic controls, and high cost of ownership keep it off the podium. 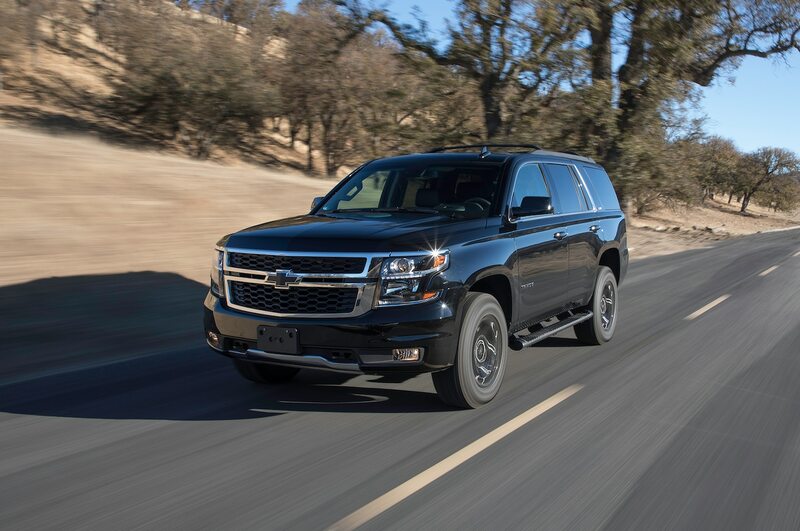 3rd: Chevrolet Tahoe LT 4WD Z71 The best-seller gets by, thanks to its slightly more usable third row, better fuel economy, stronger off-road performance (thanks, tires! 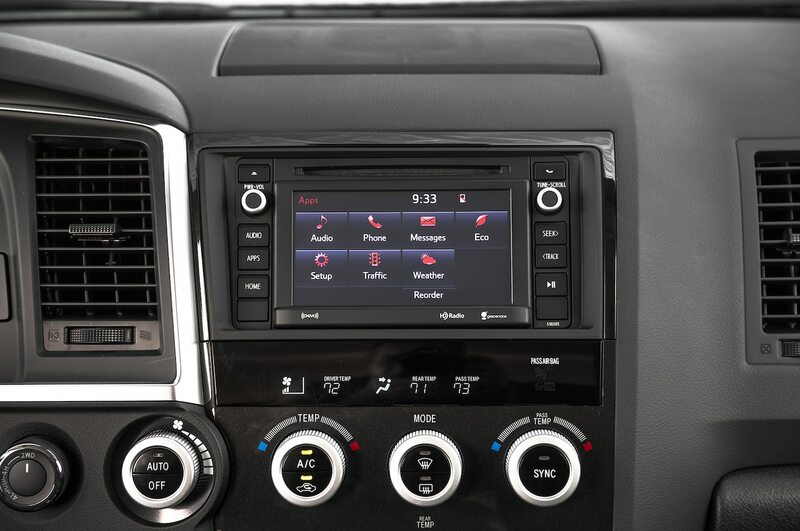 ), and modern infotainment system. 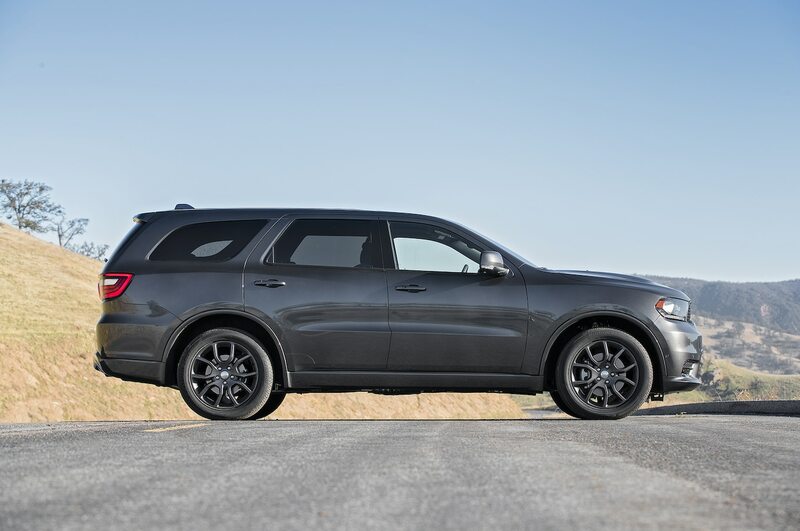 2nd: Dodge Durango 4 R/T The Durango is getting on in years, but Dodge has kept it fresh. 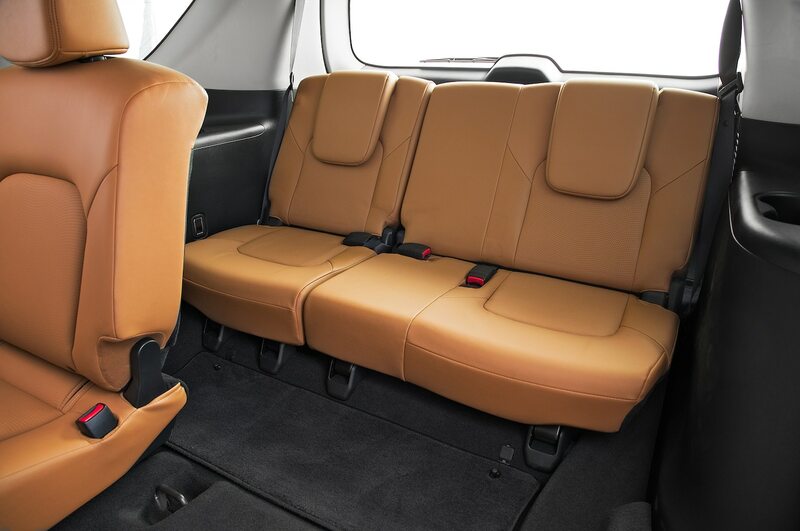 You’ll lack some interior space but gain a great driving experience, nice materials, and a cheap sticker price. 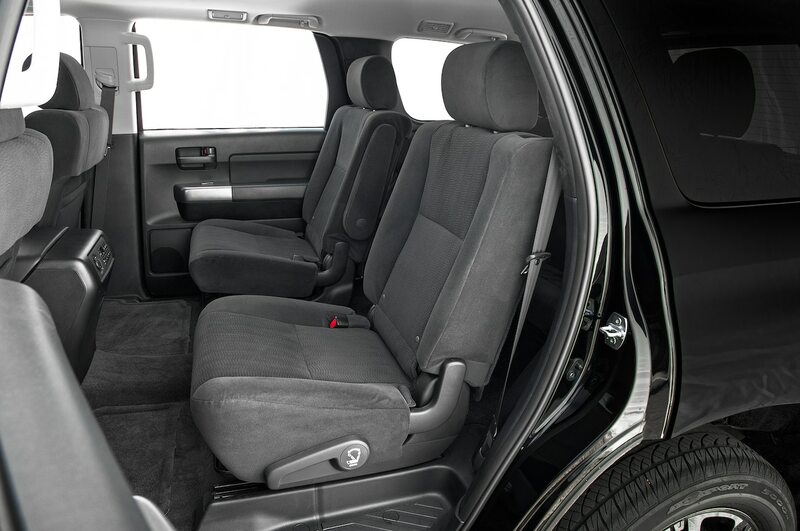 1st: Ford Expedition XLT FX4 4×4 Spacious, smart, comfortable, quick, and efficient, the Expedition does it all well. 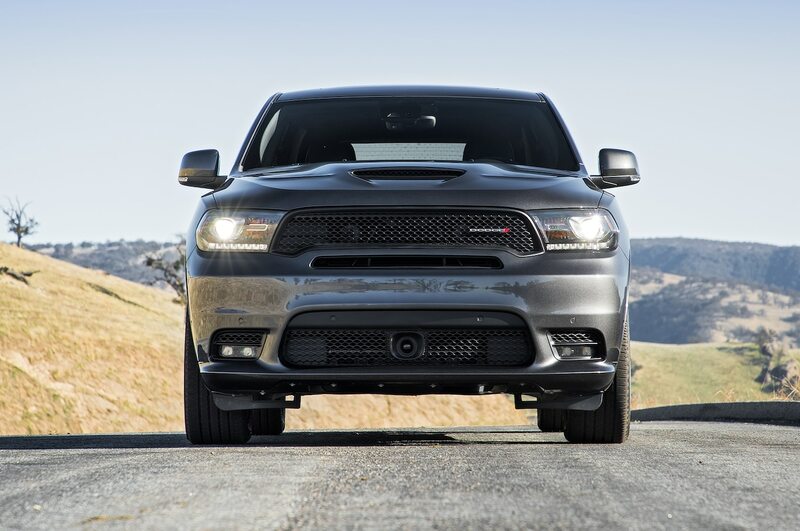 On-road, off-road, towing, you name it—this is the best in class.